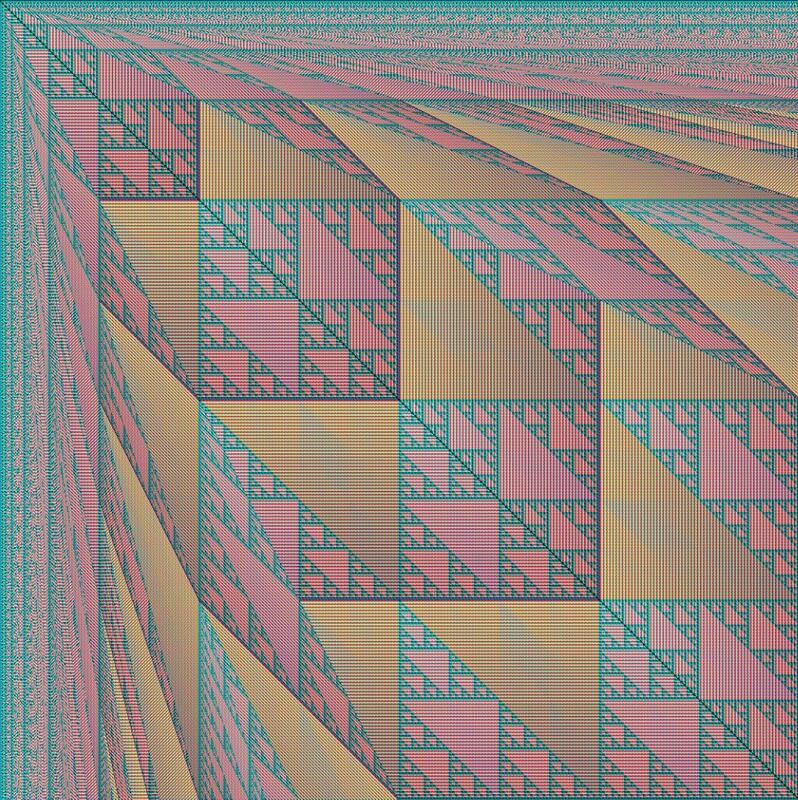 Integer math can generate amazing patterns when laid out over a grid. Even the most basic functions can yield stunningly elaborate designs! 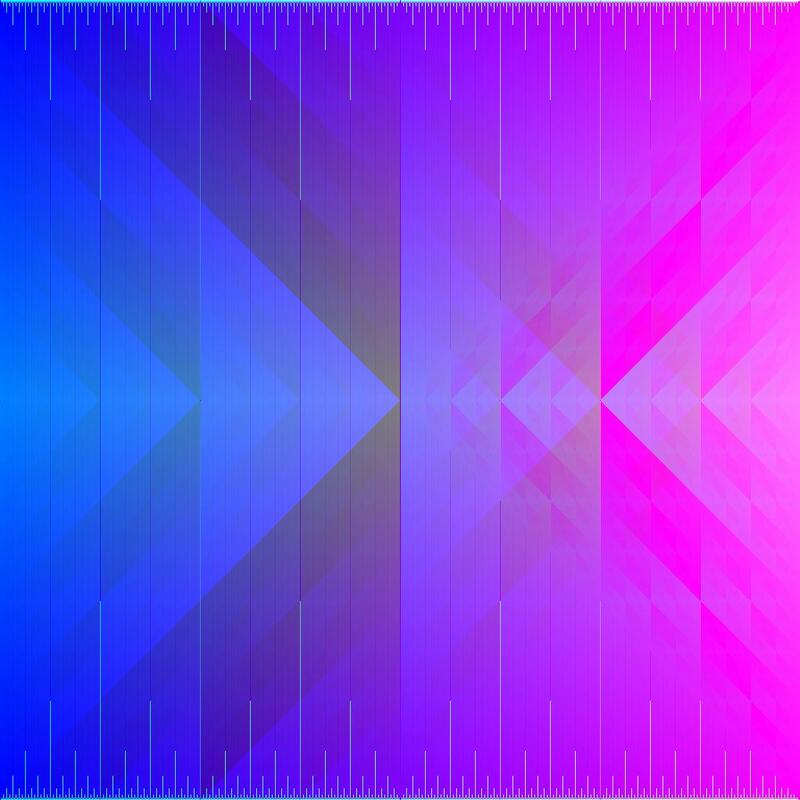 Write 3 Tweetable (meaning 140 characters or less) function bodies for the red, green, and blue values for a 1024x1024 image. The input to the functions will be two integers i (column number for the given pixel) and j (row number for the given pixel) and the output will be an unsigned short between 0 and 1023, inclusive, which represents the amount of the given color present in the pixel (i,j). Given this C++ code, substitute in your functions. 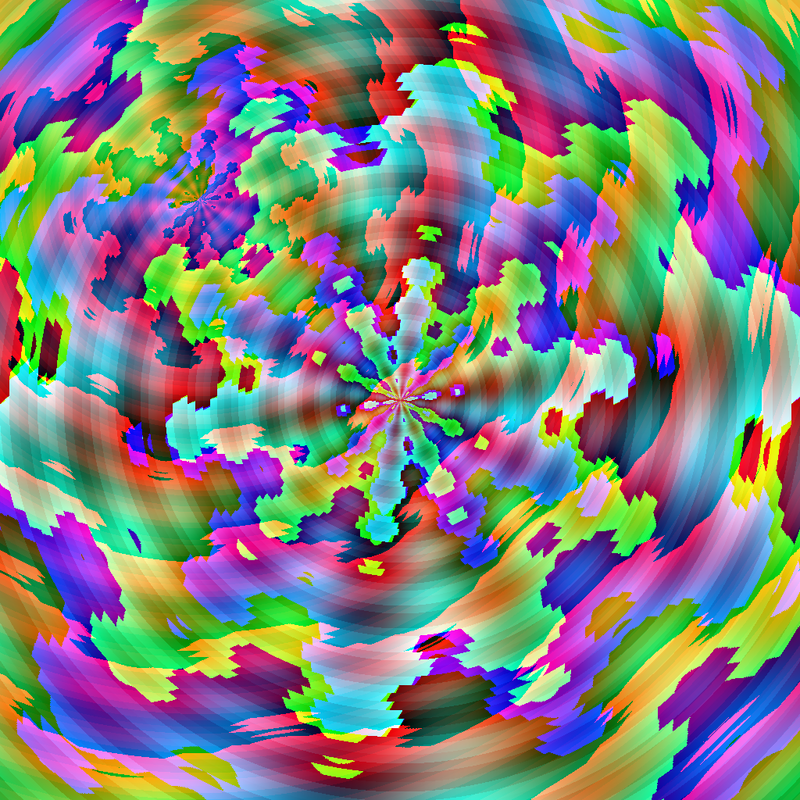 I have provided a few macros and have included the library, and you may include complex.h. You may use any functions from these libraries and/or my macros. Please do not use any external resources beyond this. If that doesn't work, please use the alternate version using unsigned chars instead of unsigned shorts. 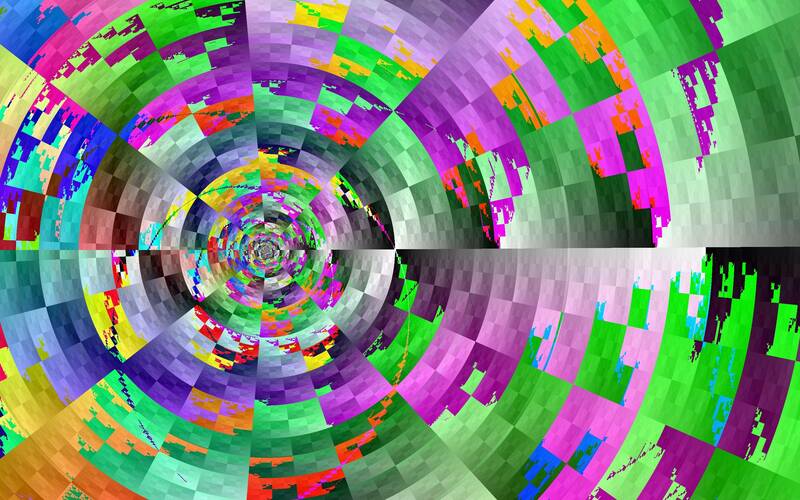 Michaelangelo has provided a cleaned up 24-bit or 48-bit color output version. You may implement your own version in another language, but it must behave in the same way as the provided C++ version, and only functions from C++'s built-ins, the library, or the provided macros may be used to make it fair. Please include either a smaller version or an embedded copy of your image. They are made into a ppm format and may need to be converted to another for proper viewing on stackexchange. Function bodies (not including signature) must be 140 characters or less. 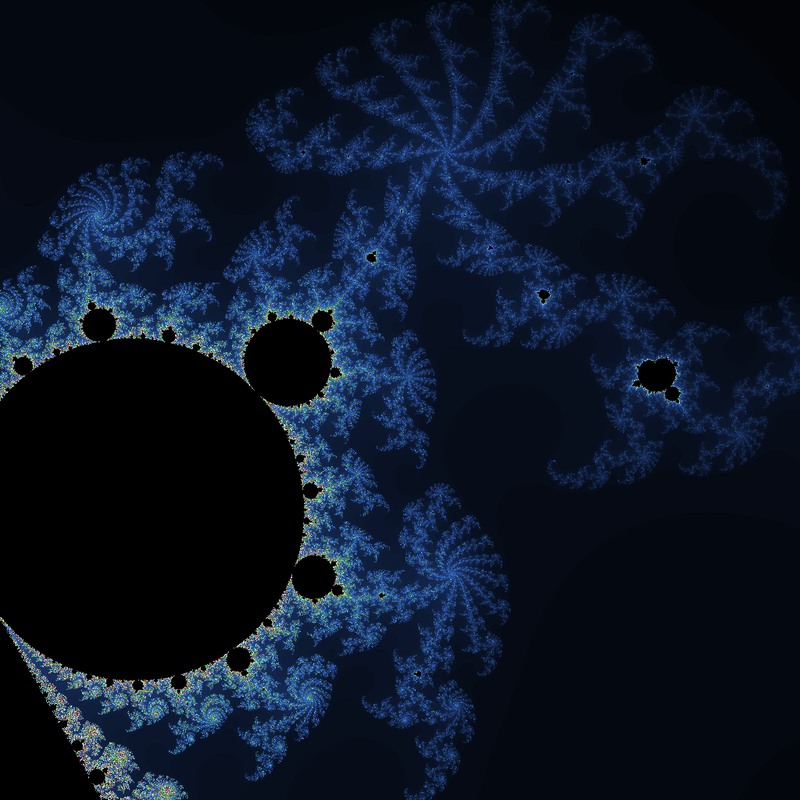 The first thing that popped into my mind was "Mandelbrot!". Reducing the code just slightly more allows for defining a wave phase P with 2 decimal places, which is just enough for frames close enough for smooth animation. 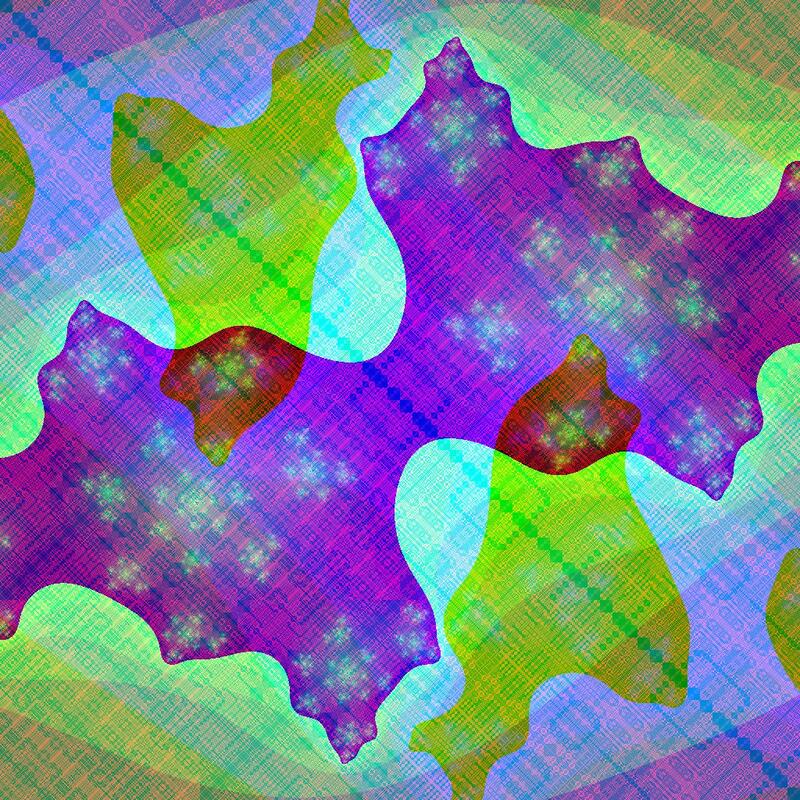 I've reduced the amplitude at this stage to avoid inducing sea sickness, and shifted the whole image up a further 151 pixels (at the cost of 1 extra character) to push the aliasing off the top of the image. 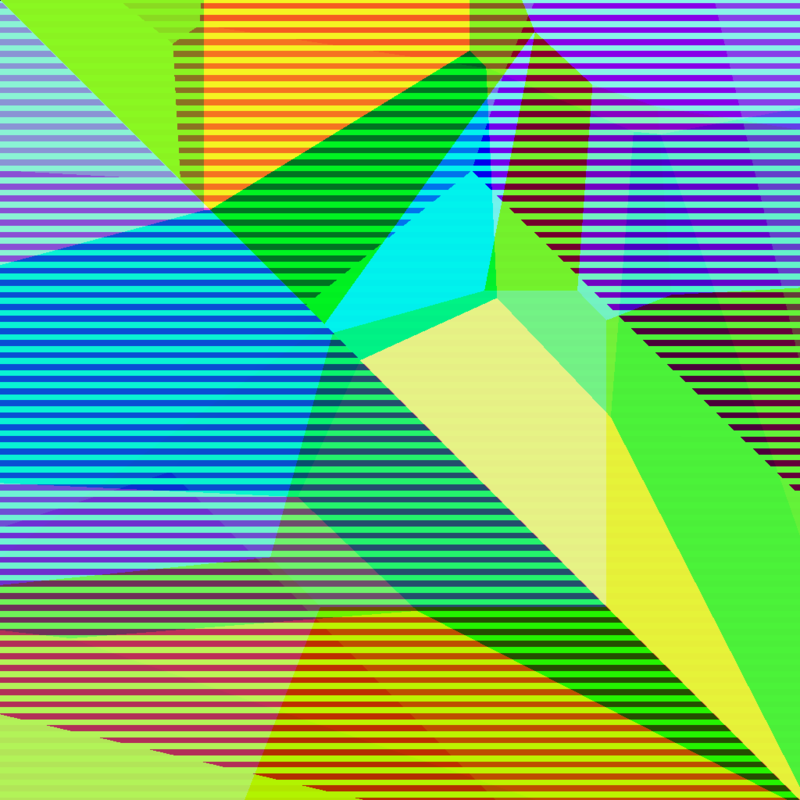 Animated aliasing is mesmerising. Here is a randomness-based entry. 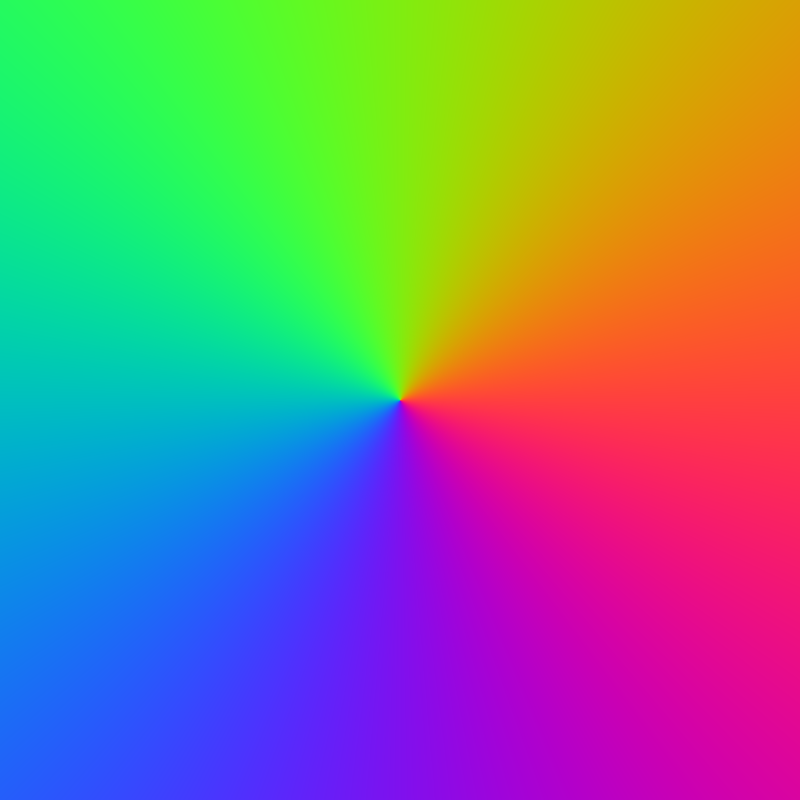 For about 0.1% of the pixels it chooses a random colour, for the others it uses the same colour as a random adjacent pixel. 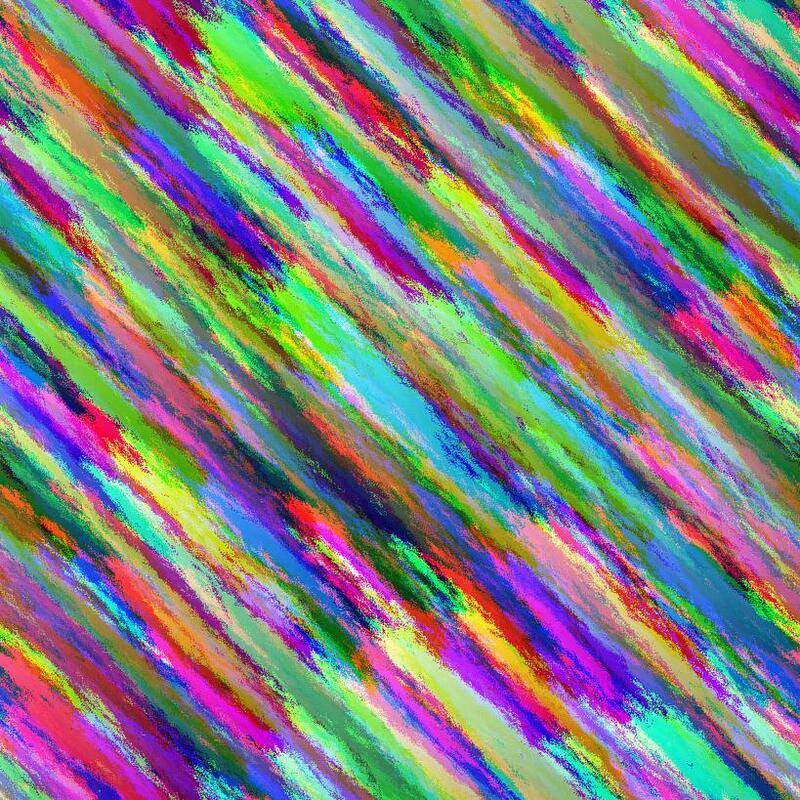 Note that each colour does this independently, so this is actually just an overlay of a random green, blue and red picture. To get different results on different runs, you'll need to add srand(time(NULL)) to the main function. By skipping pixels we can make it a bit more blurry. For some reason I can't put srand within those functions without getting a segfault. 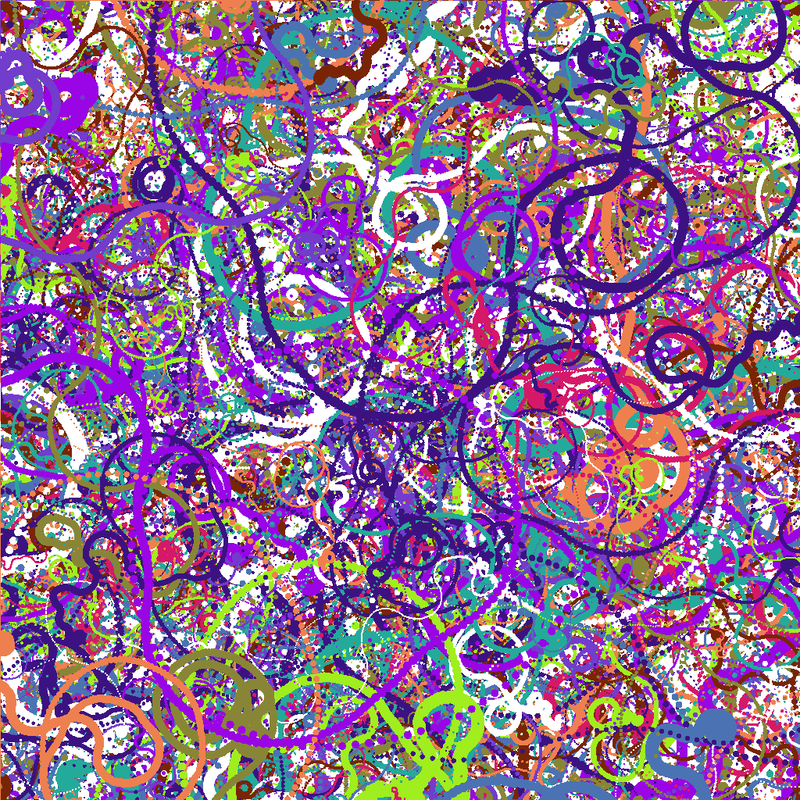 If I could make the random walks the same across all three colours it might look a bit more orderly. 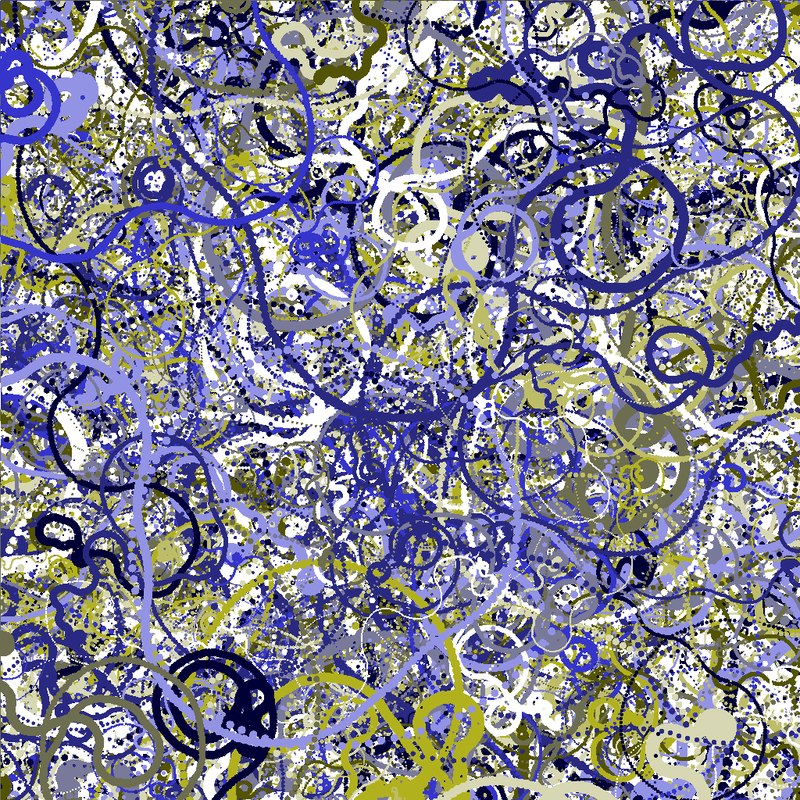 I've played around with this a bit more and created some other random paintings. Not all of these are possible within the limitations of this challenge, so I don't want to include them here. But you can see them in this imgur gallery along with some descriptions of how I produced them. Yes, I knew exactly what to name it. EDIT: No longer uses pow. EDIT 2: @PhiNotPi pointed out that I don't need to use abs as much. 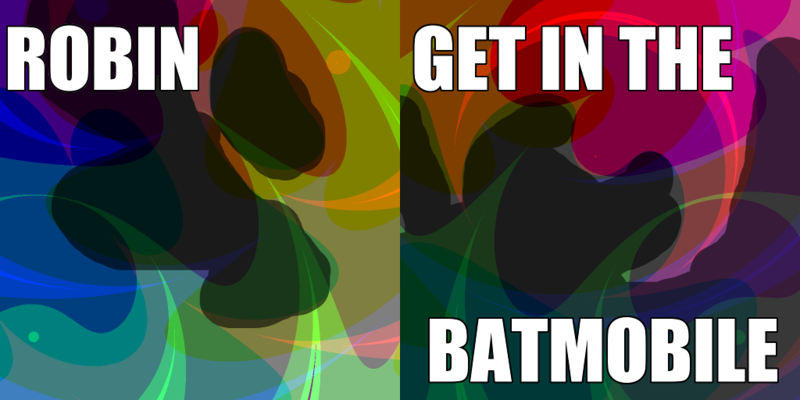 @EricTressler pointed out that my pictures have Batman in them. 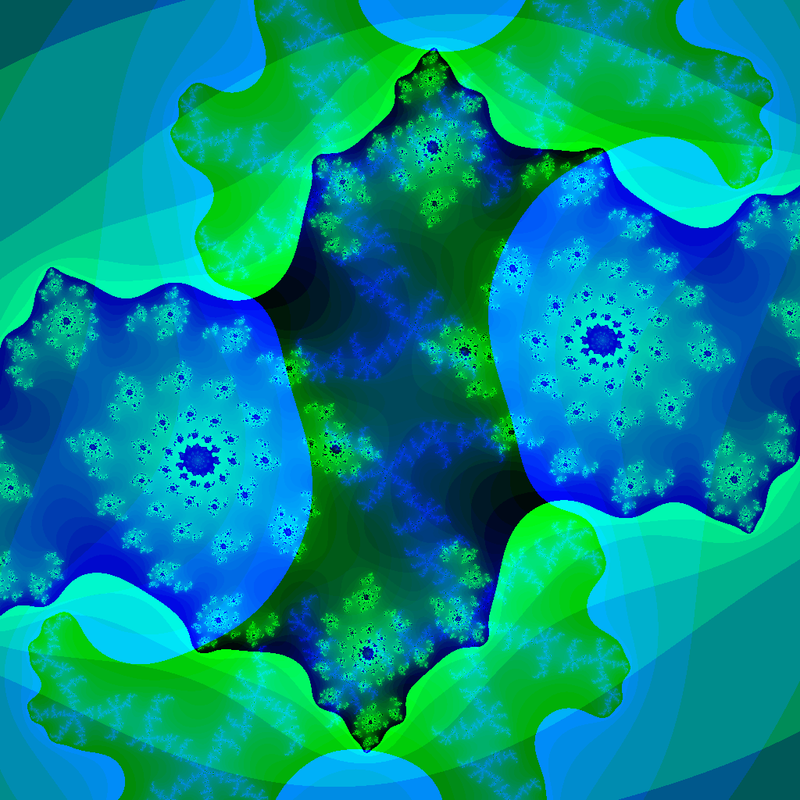 Of course, there has to be a Mandelbrot submission. Trying to improve the colour scheme now. Is it cheating if I define the computation as a macro is red_fn and use that macro in the other two so I have more characters for fancy colour selection in green and blue? 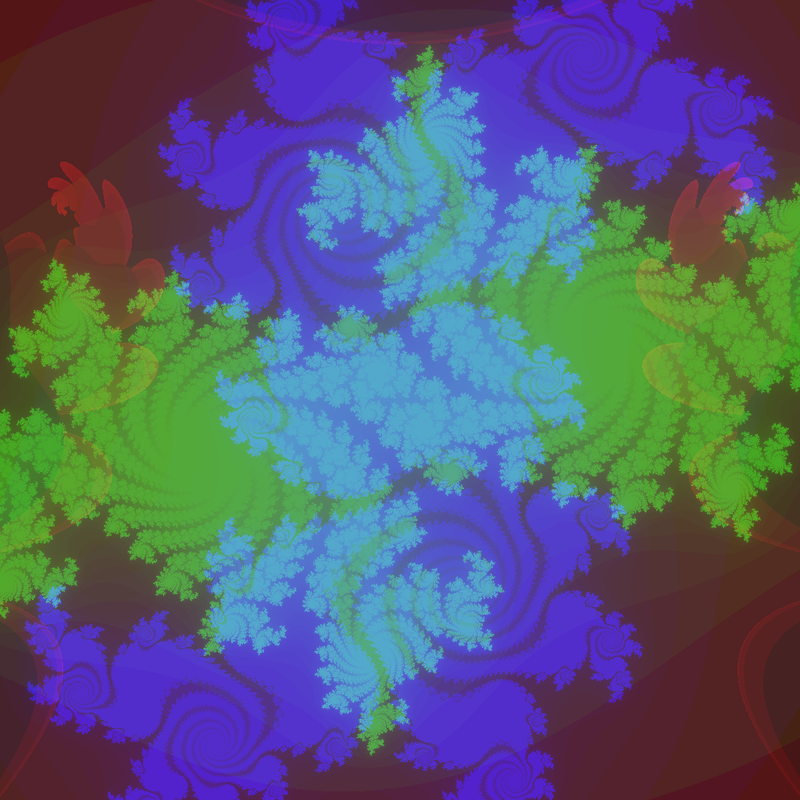 If there's a Mandelbrot, there should be a Julia set too. 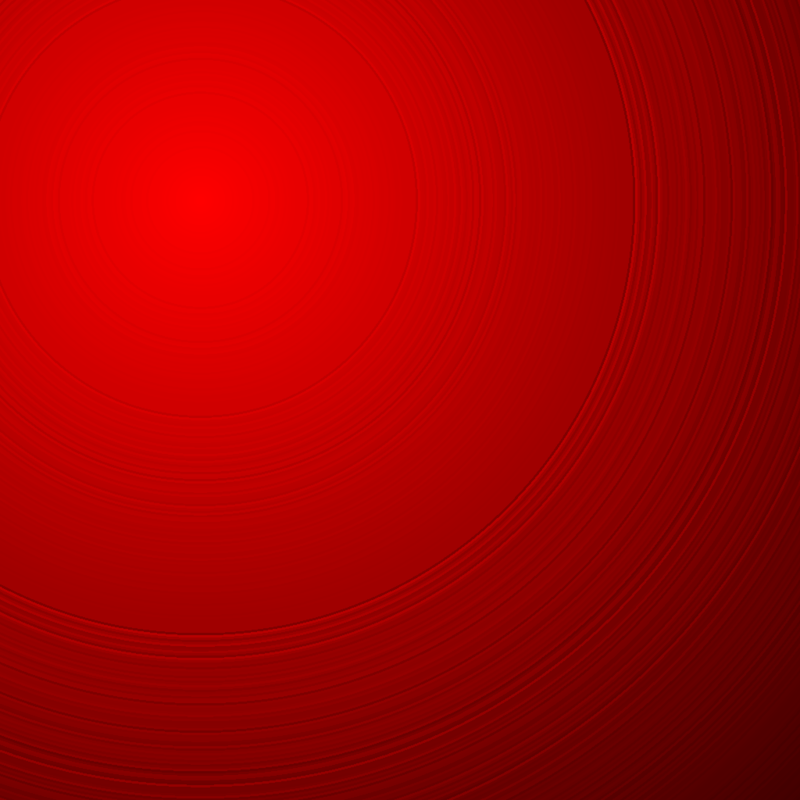 You can spend hours tweaking the parameters and functions, so this is just a quick one that looks decent. Would you like some RNG? OK, Sparr's comment put me on the track to randomize the parameters of these little Julias. I first tried to do bit-level hacking with the result of time(0) but C++ doesn't allow hexadecimal floating point litterals so this was a dead-end (with my limited knowledge at least). I could have used some heavy casting to achieve it, but that wouldn't have fit into the 140 bytes. I didn't have much room left anyway, so I had to drop the red Julia to put my macros and have a more conventional RNG (timed seed and real rand(), woohoo!). Whoops, something is missing. Obviously, these parameters have to be static or else you have some weird results (but funny, maybe I'll investigate a bit later if I find something interesting). This one is interesting because it doesn't use the i, j parameters at all. Instead it remembers state in a static variable. Edit: It's a proper Buddhabrot now! Edit: I managed to cap the colour intensity within the byte limit, so there are no more falsely black pixels due to overflow. 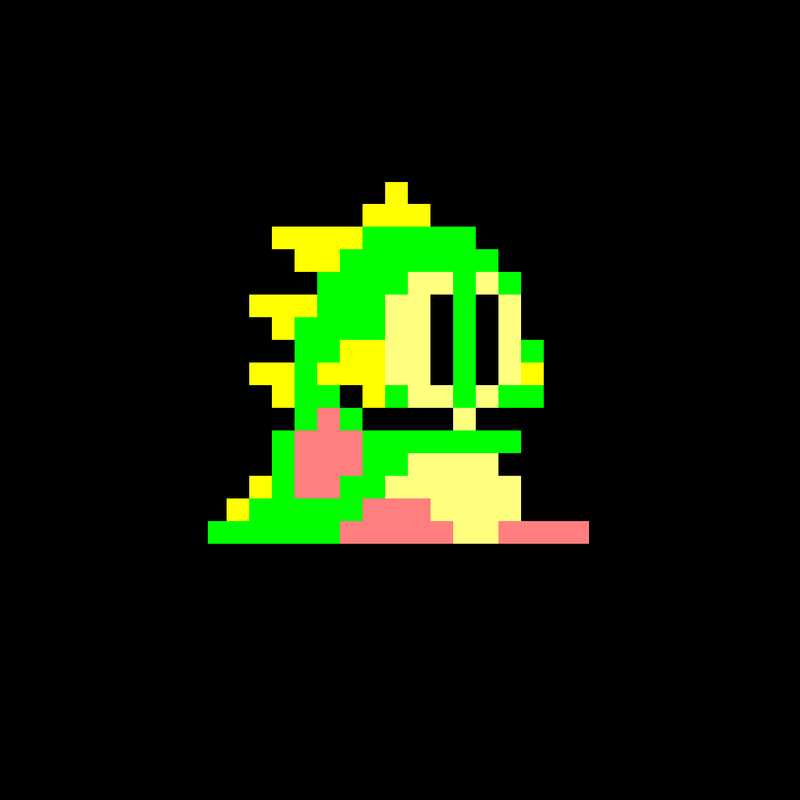 There are some bytes left for a better colour scheme, but so far I haven't found anything that beats the grey-scale image. 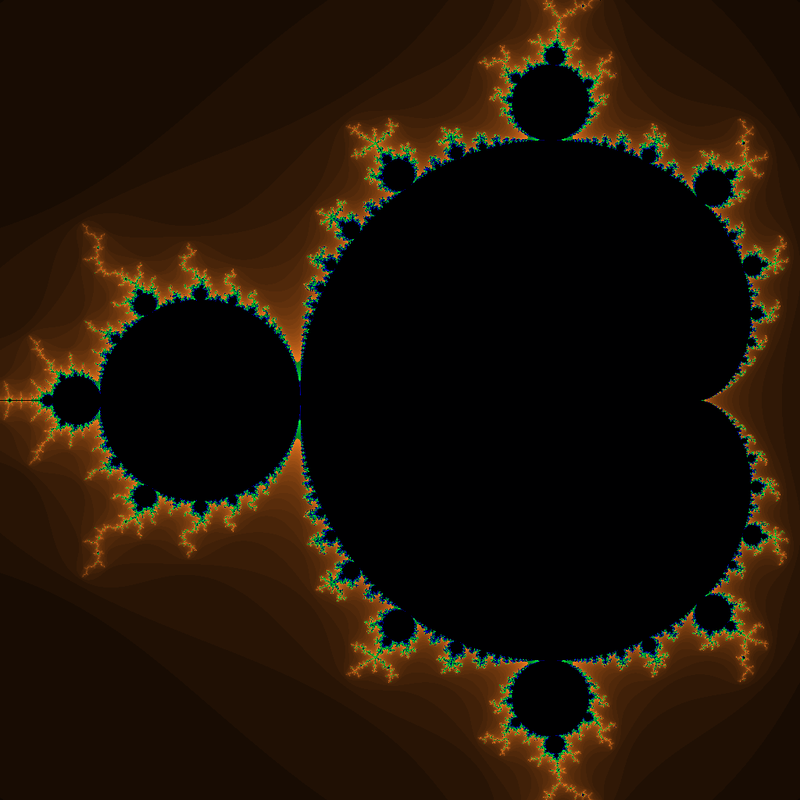 To change the Mandelbrot recursion depth, adjust both instances of 5e5 in BL to your iteration count. To change the grid resolution, change all four 4096 in RD to your desired resolution and the 1024. in GR by the same factor to maintain the correct scaling. You will probably also need to scale the return c[i][j] in GR since that only contains the absolute number of visits of each pixel. 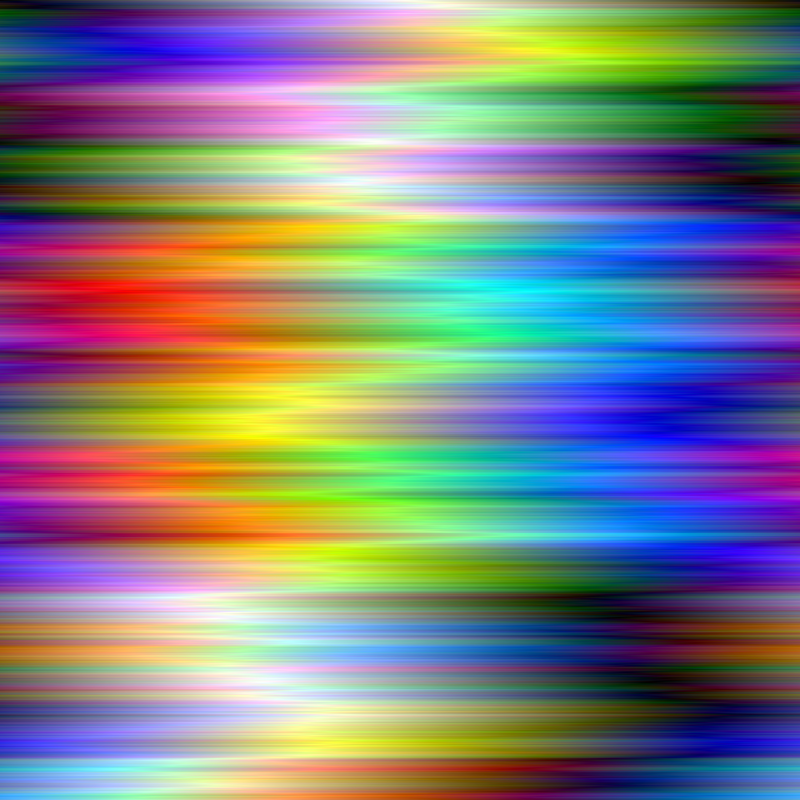 The maximum colour seems to be mostly independent of the iteration count and scales linearly with the total number of starting points. 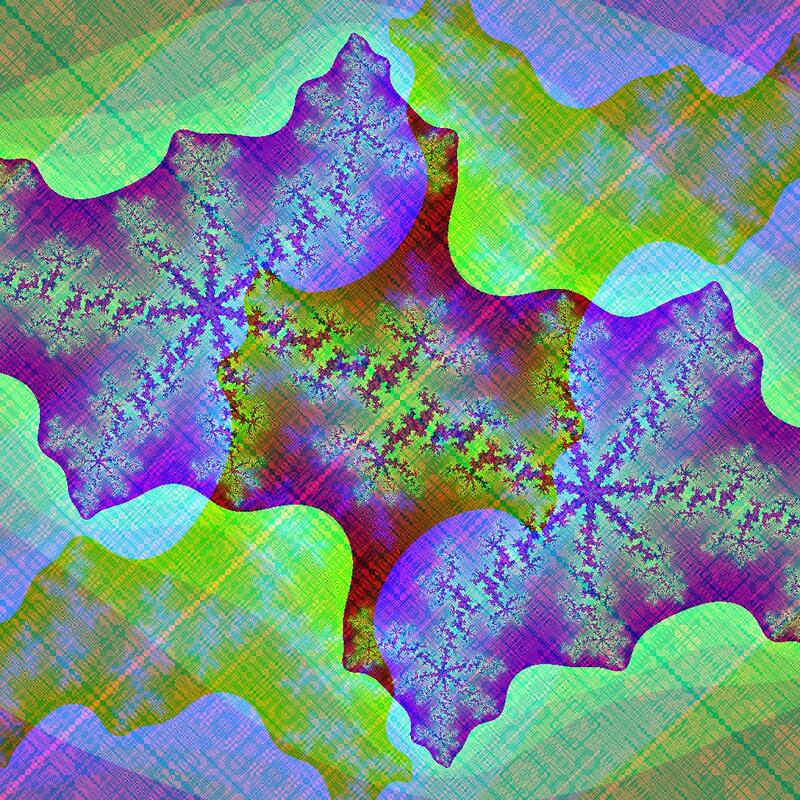 So if you want to use a 1k by 1k grid, you might want to return c[i][j]*16; or similar, but that factor sometimes needs some fiddling. 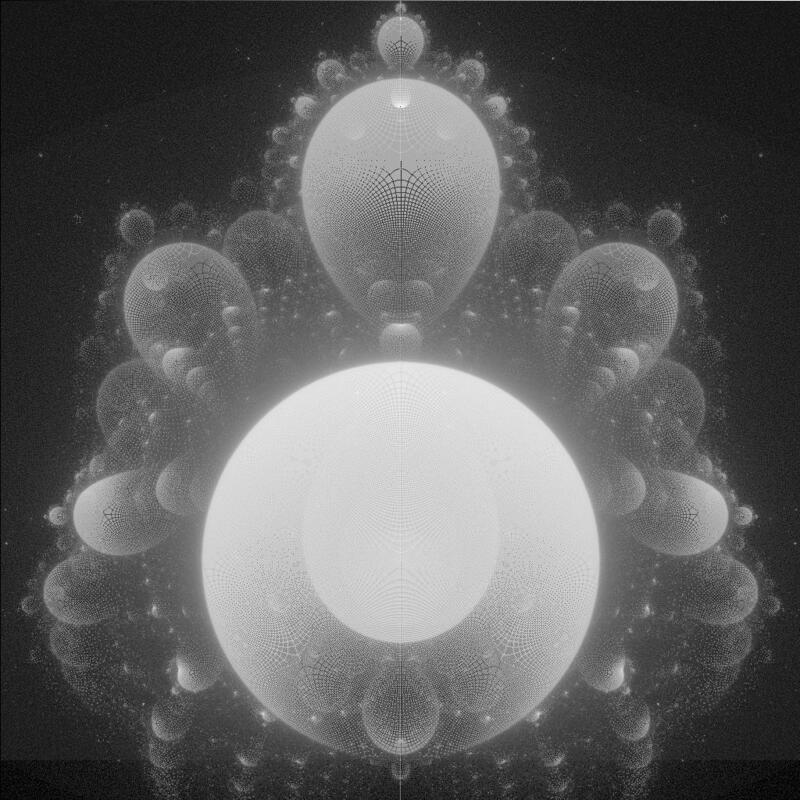 For those not familiar with the Buddhabrot (like myself a couple of days ago), it's based on the Mandelbrot computation, but each pixel's intensity is how often that pixel was visited in the iterations of the escaping trajectories. If we're counting the visits during non-escaping trajectories, it's an Antibuddhabrot. 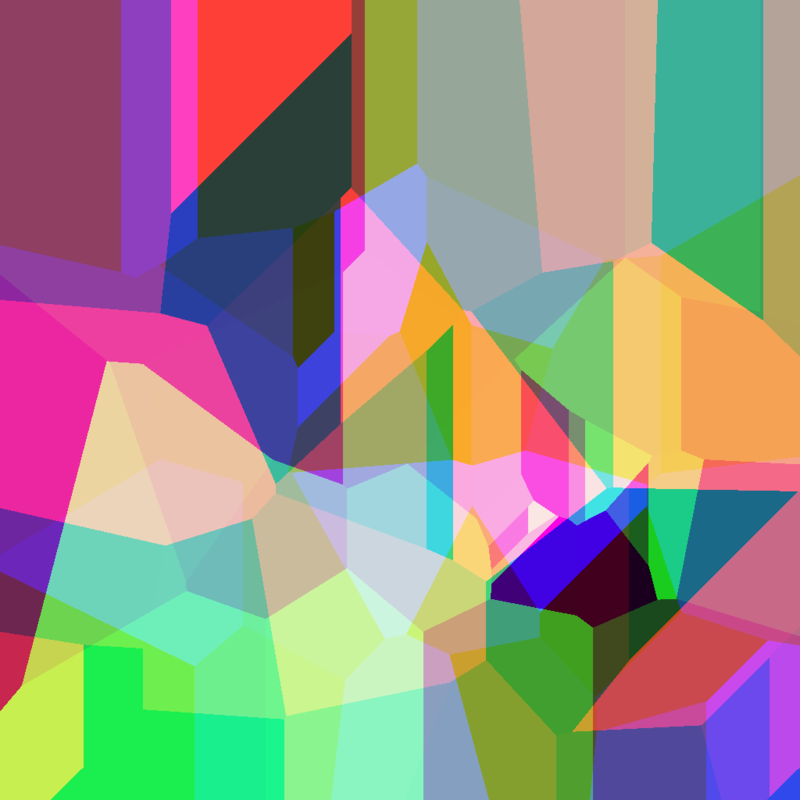 There is an even more sophisticated version called Nebulabrot where you use a different recursion depth for each colour channel. But I'll leave that to someone else. For more information, as always, Wikipedia. Originally, I didn't distinguish between escaping and non-escaping trajectories. 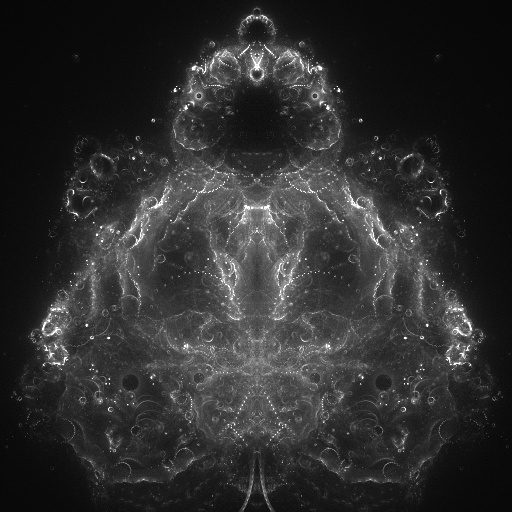 That generated a plot which is the union of a Buddhabrot and an Antibuddhabrot (as pointed out by githubphagocyte). This one looks a bit like a faded photograph... I like that. 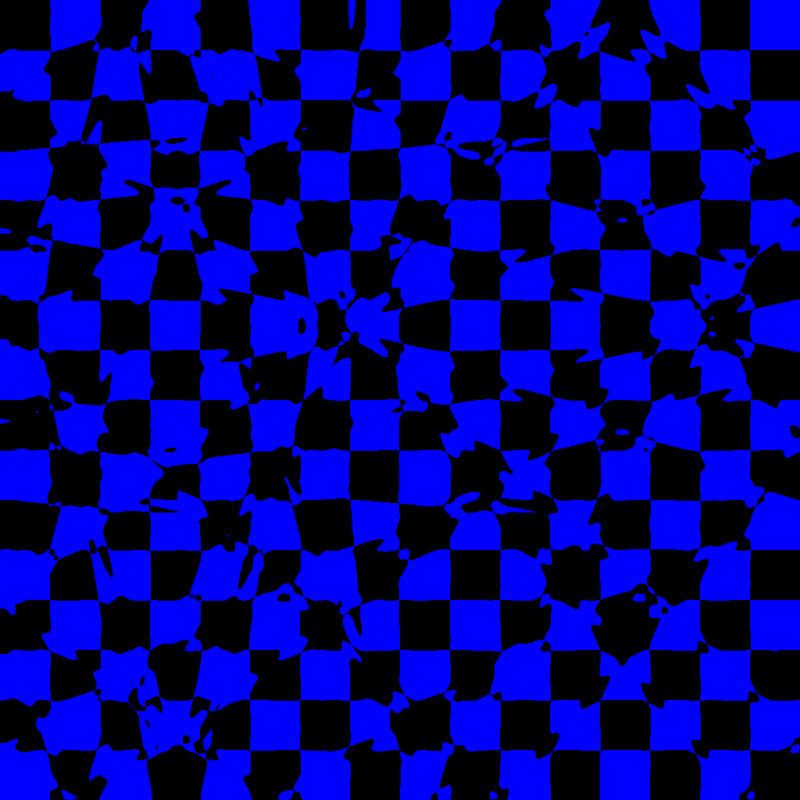 You may have seen the chaos game method of approximating Sierpinski's Triangle by plotting points half way to a randomly chosen vertex. 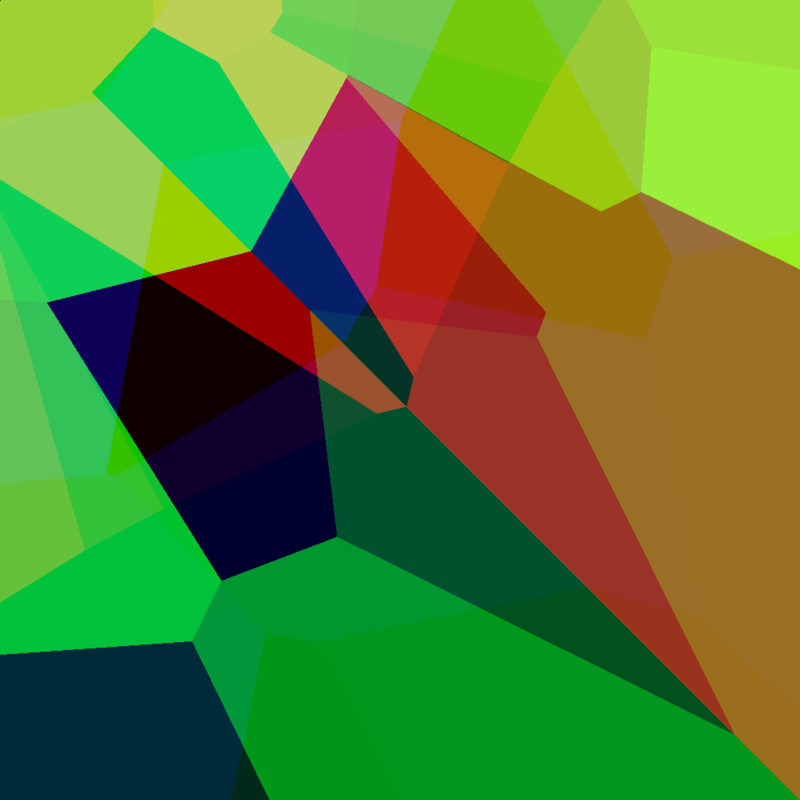 Here I have taken the same approach using 5 vertices. The shortest code I could settle on included hard coding the 5 vertices, and there was no way I was going to fit it all into 140 characters. So I've delegated the red component to a simple backdrop, and used the spare space in the red function to define a macro to bring the other two functions under 140 too. So everything is valid at the cost of having no red component in the pentagon. Thanks to Martin Büttner for the idea mentioned in the question's comments about defining a macro in one function to then use in another, and also for using memoisation to fill the pixels in an arbitrary order rather than being restricted to the raster order of the main function. 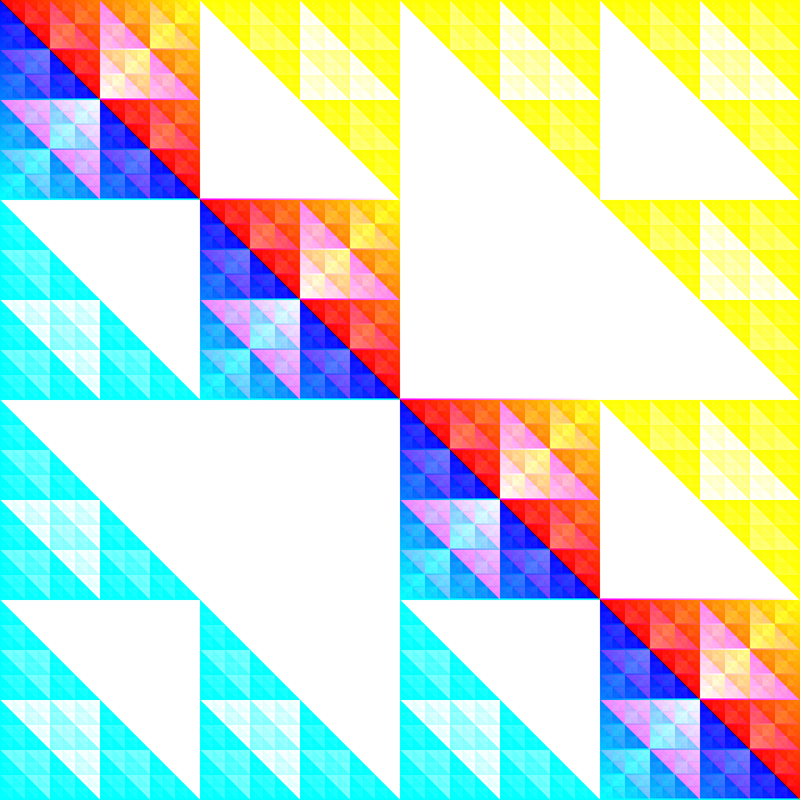 Sierpinski music. :D The guys on chat say it looks more like the punched paper for music boxes. 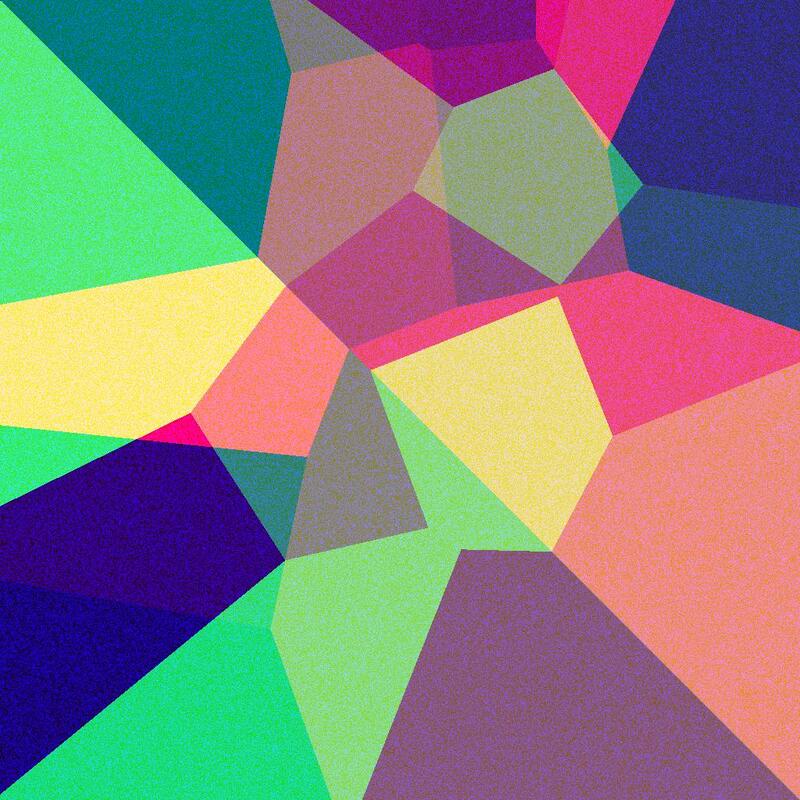 Random Voronoi diagram generator anyone? OK, this one gave me a hard time. 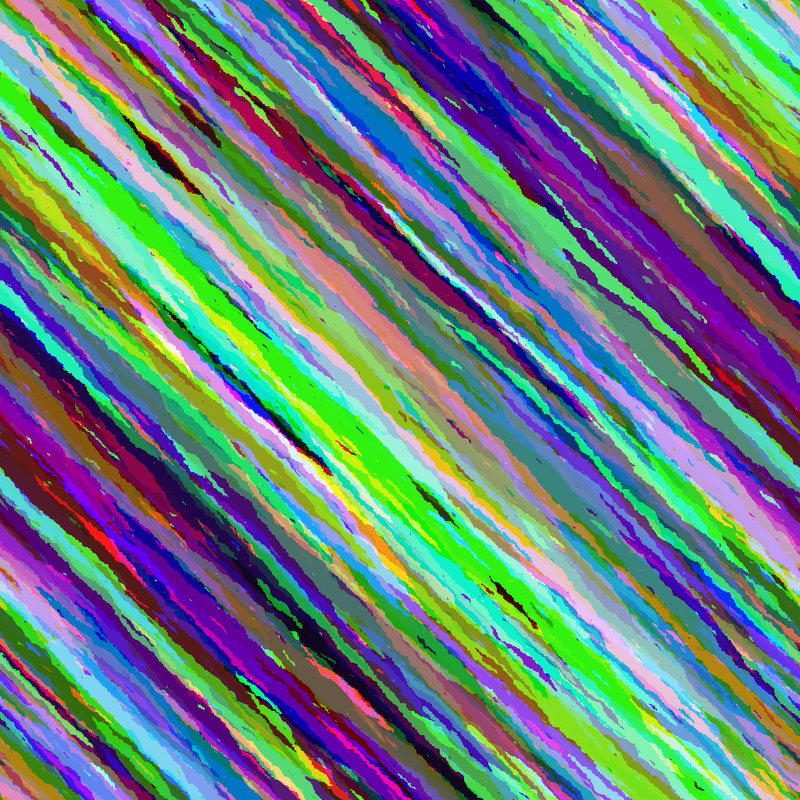 I think it's pretty nice though, even if the results are not so arty as some others. 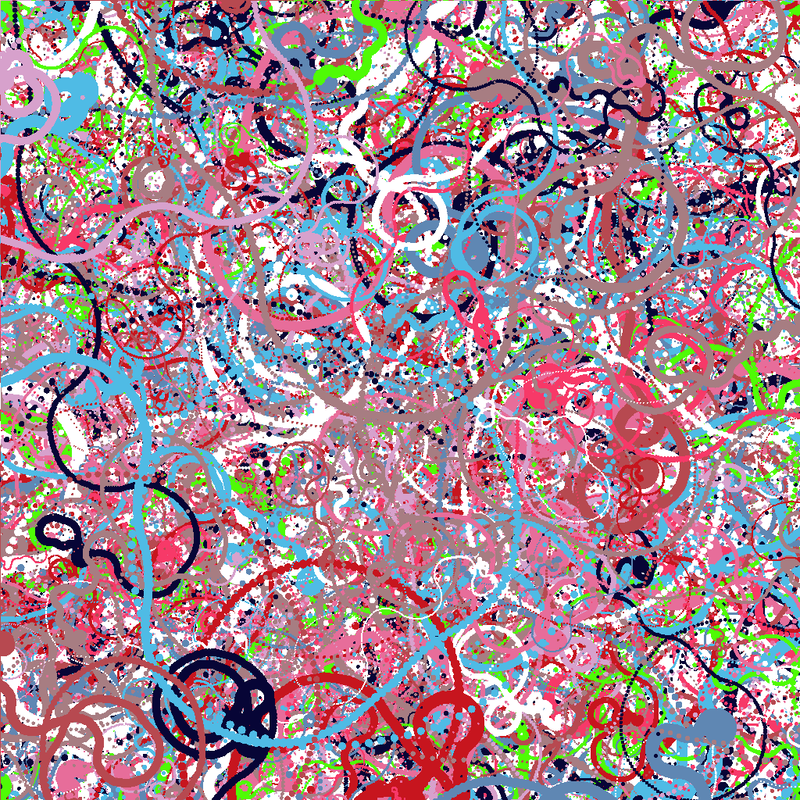 That's the deal with randomness. 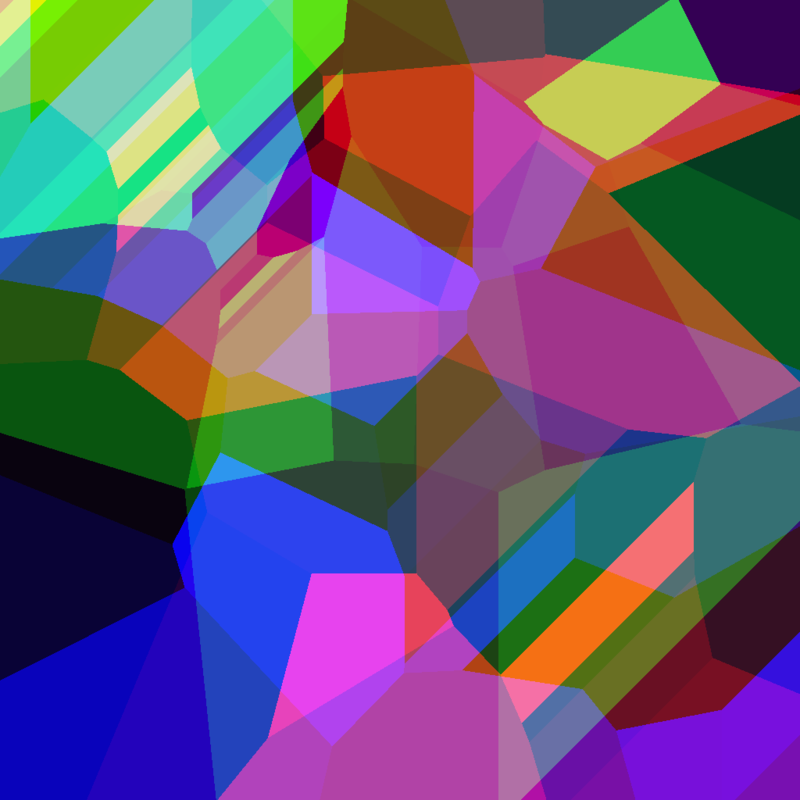 Maybe some intermediate images look better, but I really wanted to have a fully working algorithm with voronoi diagrams. This is one example of the final algorithm. 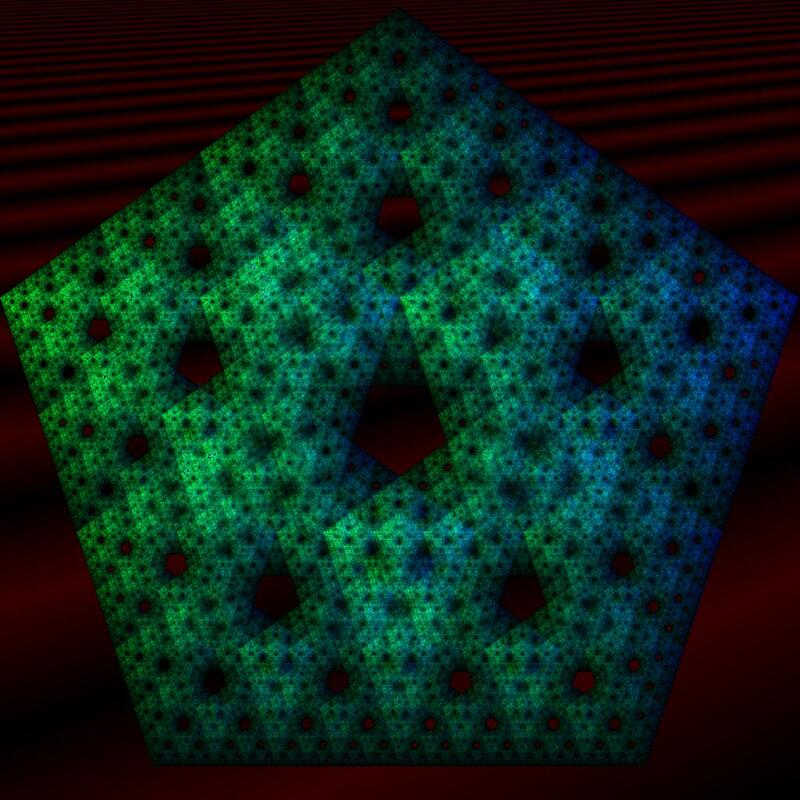 The image is basically the superposition of three voronoi diagram, one for each color component (red, green, blue). It took me a lot of efforts, so I feel like sharing the results at different stages, and there are nice (incorrect) ones to show. I have converted it to jpeg because the original png was too heavy for upload (>2MB), I bet that's way more than 50 shades of grey! I couldn't afford to have another table of coordinates randomly generated for the y axis, so I needed a simple way to get " random " ones in as few characters as possible. I went for using the x coordinate of another point in the table, by doing a bitwise AND on the index of the point. But at this time I was way over 140 chars, so I needed to golf it down quite a bit. Just kidding, this is not wanted but kind of cool, methinks. I have now a working piece of code, so let's go from 25 to 60 points. And here we are, at the same point as the very first image from this post. Let's now explain the code for the rare ones that would be interested. 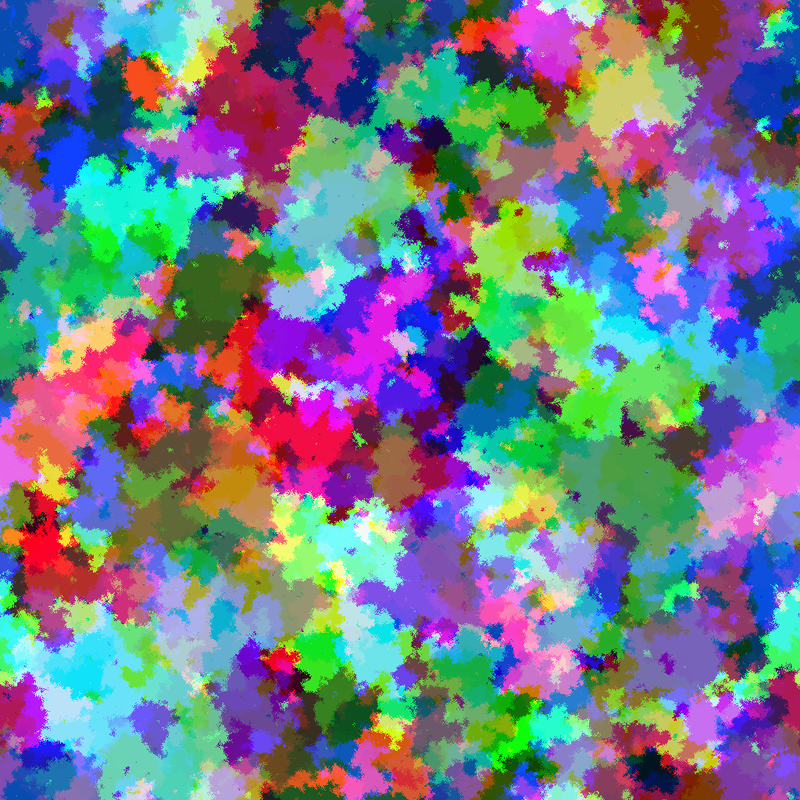 With limited code space I thought this colouring was pretty cool. 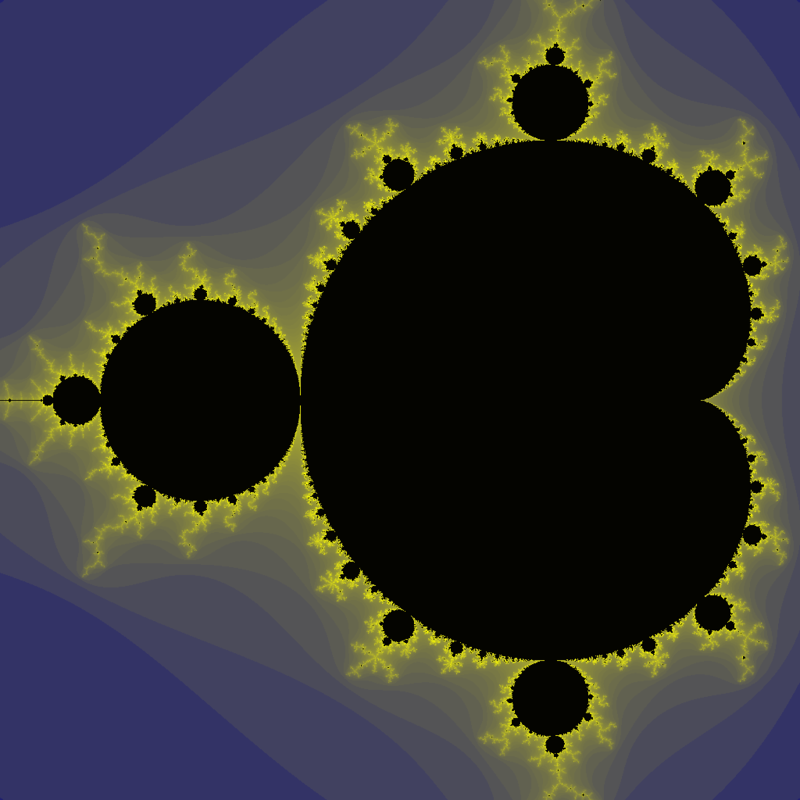 I also made a variation of the Mandelbrot set. 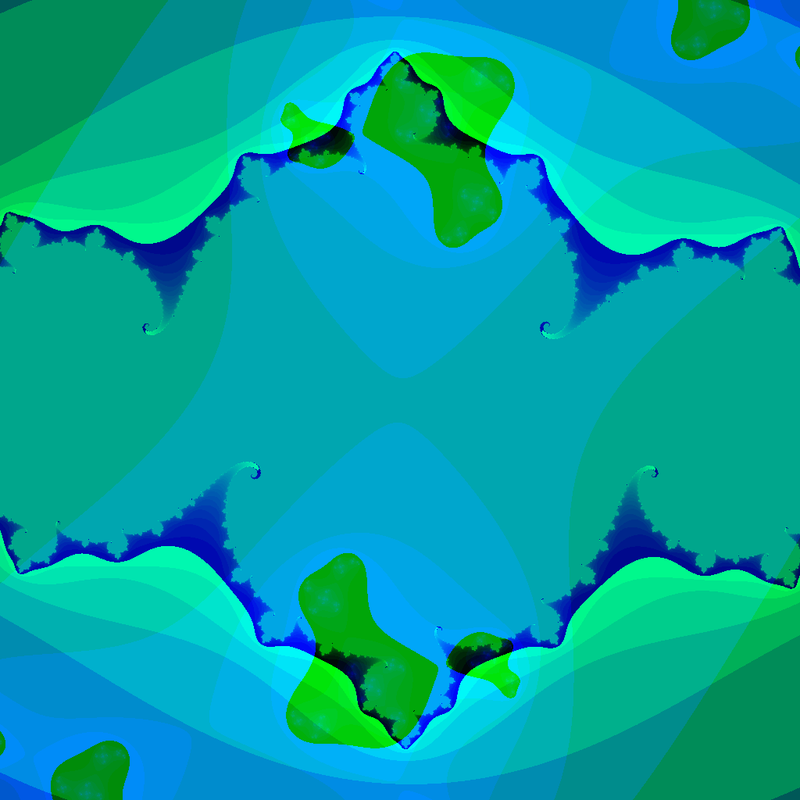 It uses a map similar to the Mandelbrot set map. 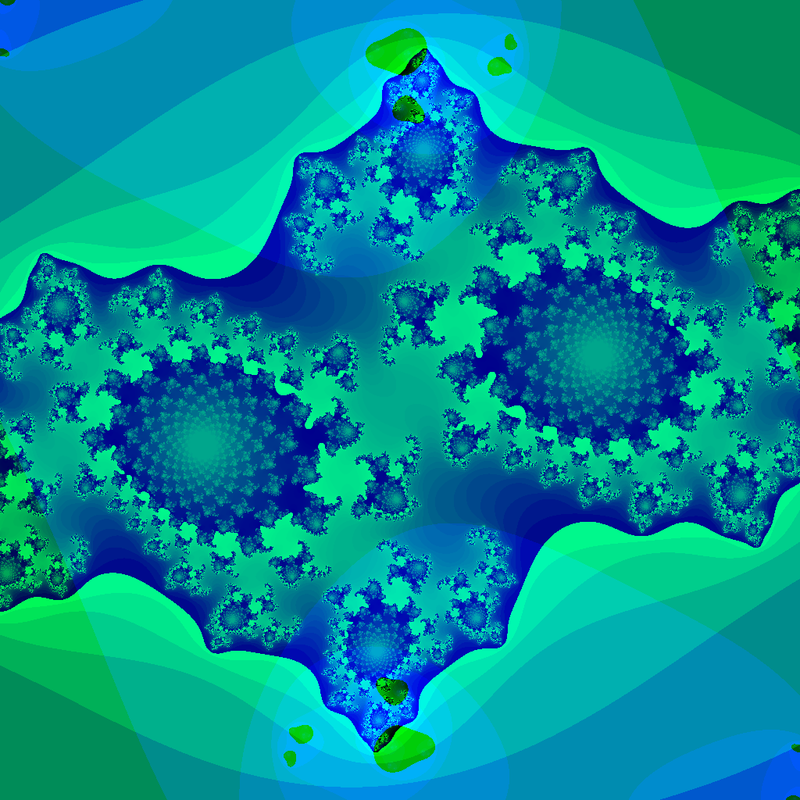 Say M(x,y) is the Mandelbrot map. Then M(sin(x),cos(y)) is the map I use, and instead of checking for escaping values I use x, and y since they are always bounded. 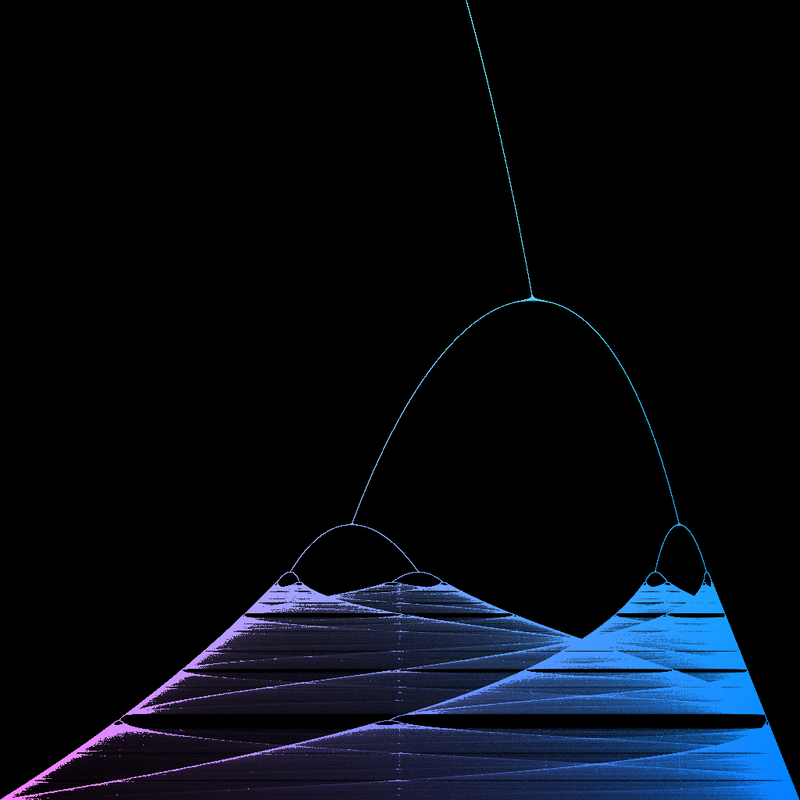 I couldn't get the OPs version with unsigned short and colour values up to 1023 working, so until that is fixed, here is a version using char and maximum colour value of 255.
double x = 1.0001*b/DIM;    // This is x in the logistic bifurcation diagram (y axis). The 1.0001 is because nice fractions can lead to pathological behavior. 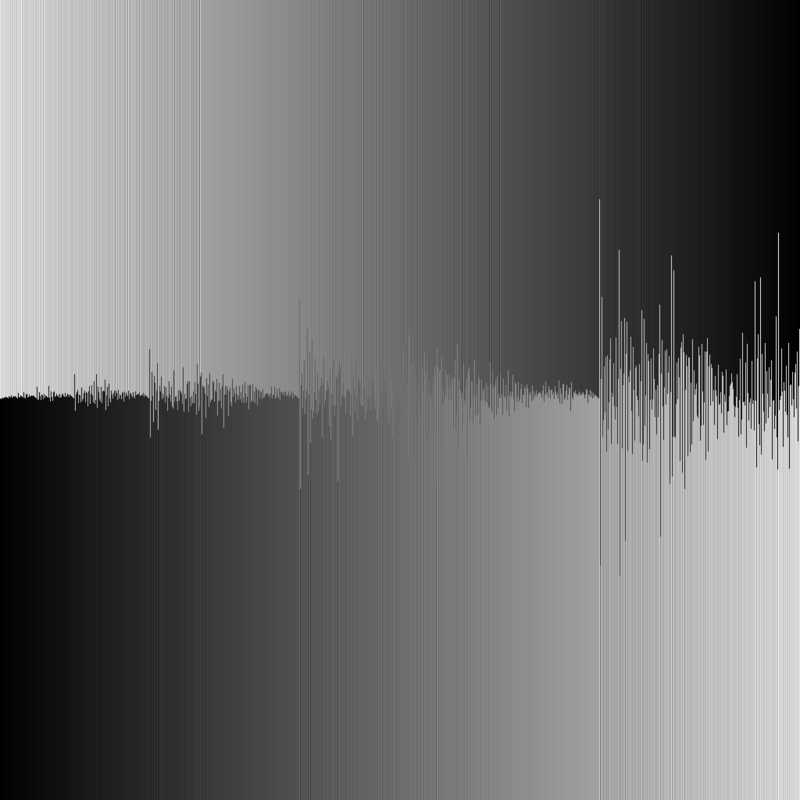 Where the values of x fall the most often for a given r (j value), the plot becomes lighter (usually depicted as darker). I've always been fascinated by diffusion limited aggregation and the number of different ways it appears in the real world. I found it difficult to write this in just 140 characters per function so I've had to make the code horrible (or beautiful, if you like things like ++d%=4 and for(n=1;n;n++)). The three colour functions call each other and define macros for each other to use, so it doesn't read well, but each function is just under 140 characters. 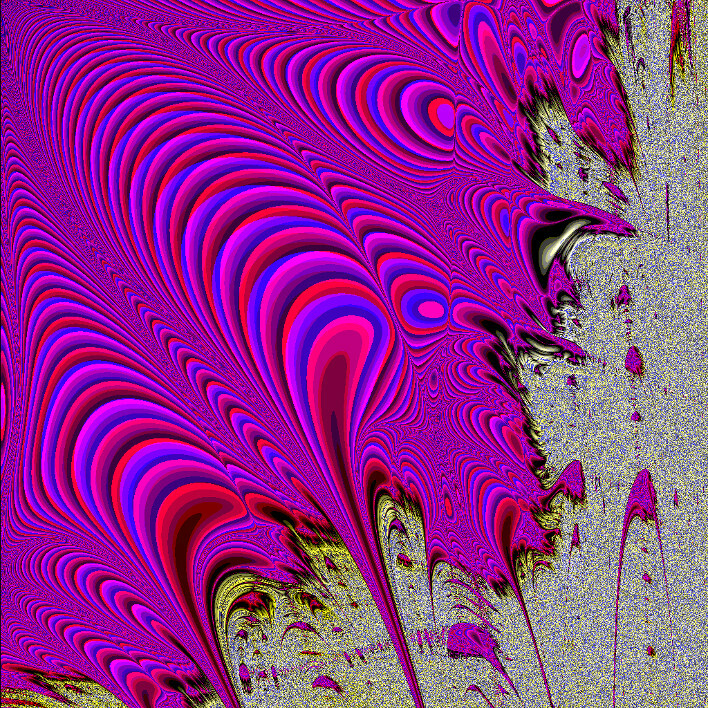 To visualise how the particles gradually aggregate, I produced snapshots at regular intervals. 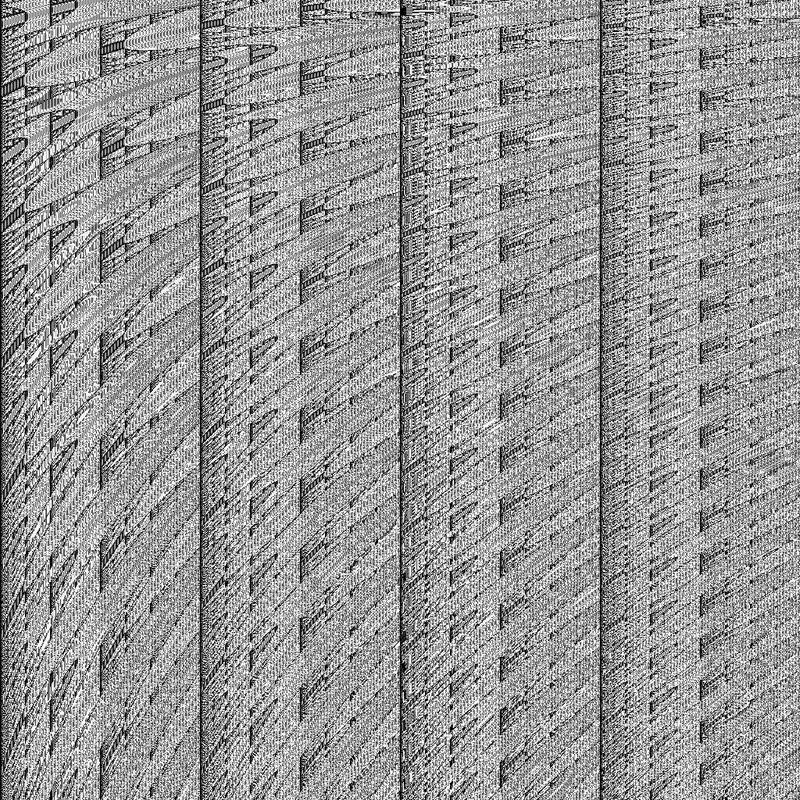 Each frame was produced by replacing the 1 in for(n=1;n;n++) with 0, -1<<29, -2<<29, -3<<29, 4<<29, 3<<29, 2<<29, 1<<29, 1. This kept it just under the 140 character limit for each run. You can see that aggregates growing close to each other deprive each other of particles and grow more slowly. By making a slight change to the code you can see the remaining particles that haven't become attached to the aggregates yet. This shows the denser regions where growth will happen more quickly and the very sparse regions between aggregates where no more growth can occur due to all the particles having been used up. This is 140 characters exactly if you don't include the function headers and brackets. 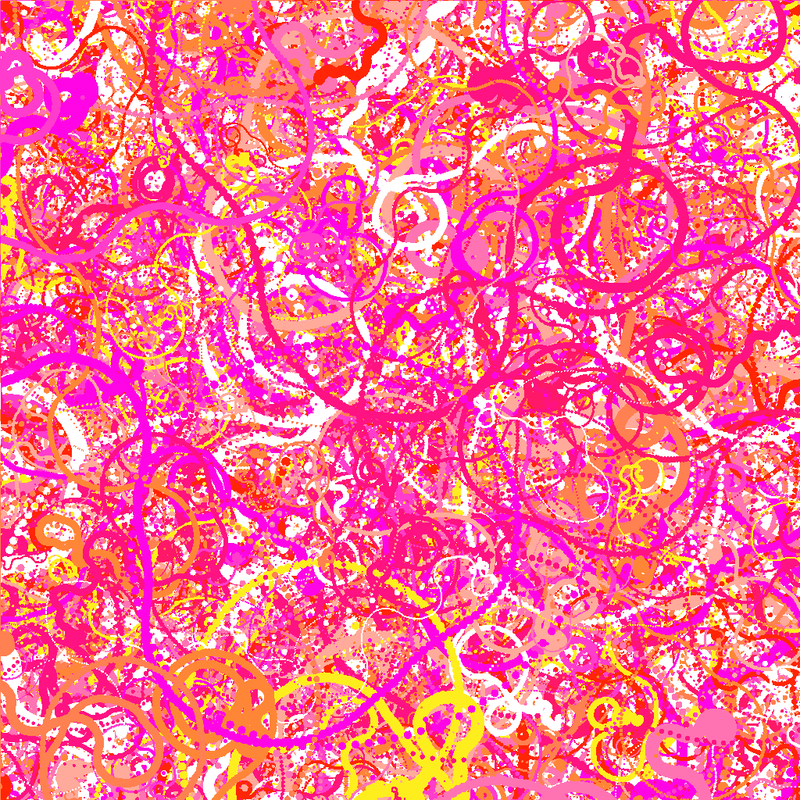 It's as much spiral complexity I could fit in the character limit. I gradually built on a simple spiral, adding patterns to the spiral edges and experimenting with how different spirals could be combined to look cool. Here is an ungolfed version with comments explaining what each piece does. 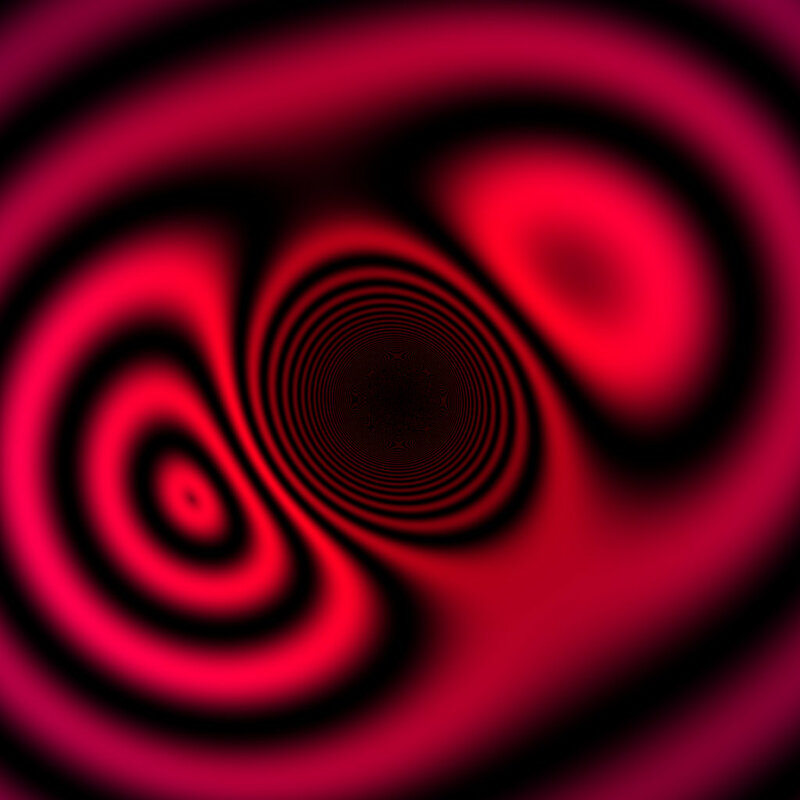 Messing with parameters can produce some interesting results. //   DIM value, or if you make separate DIMX and DIMY values! 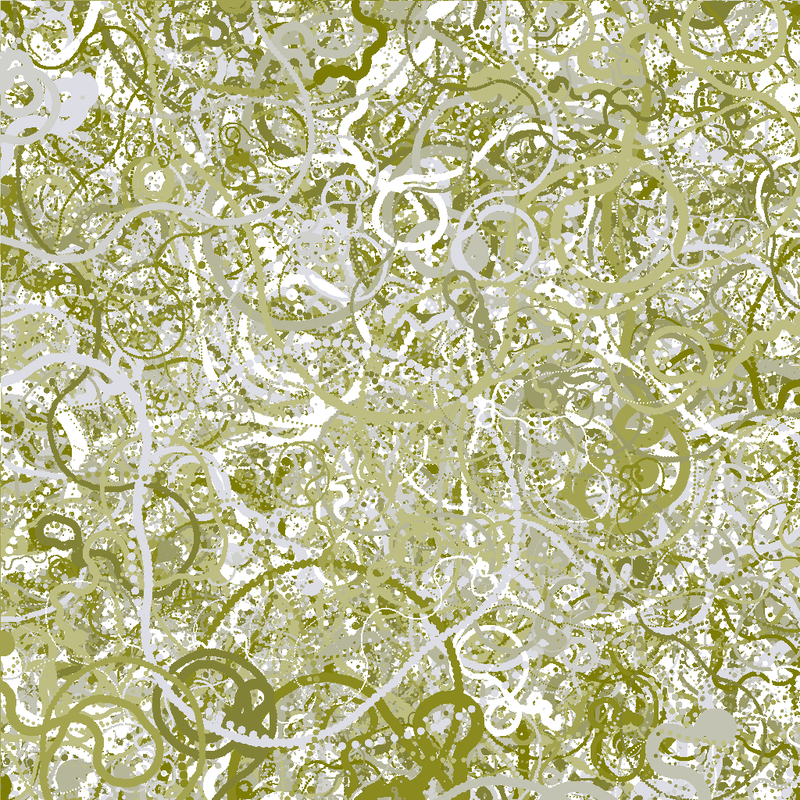 Here, the spirals are lined up but have different edge patterns. 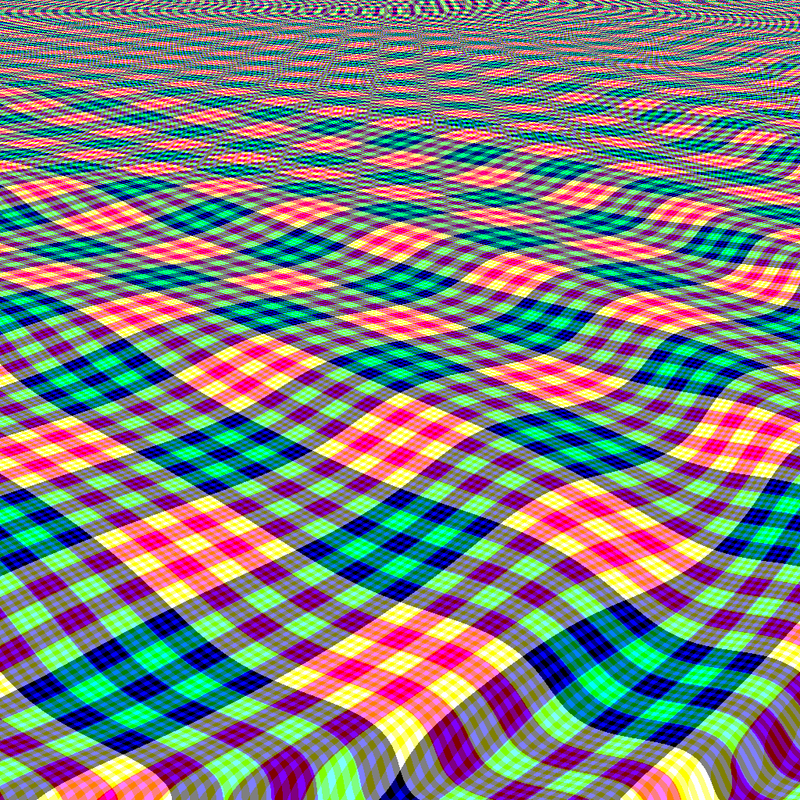 Instead of the blocky edges in the main example, this has edges entirely comprised of sin waves. And, here's the imgur album with all images in it. 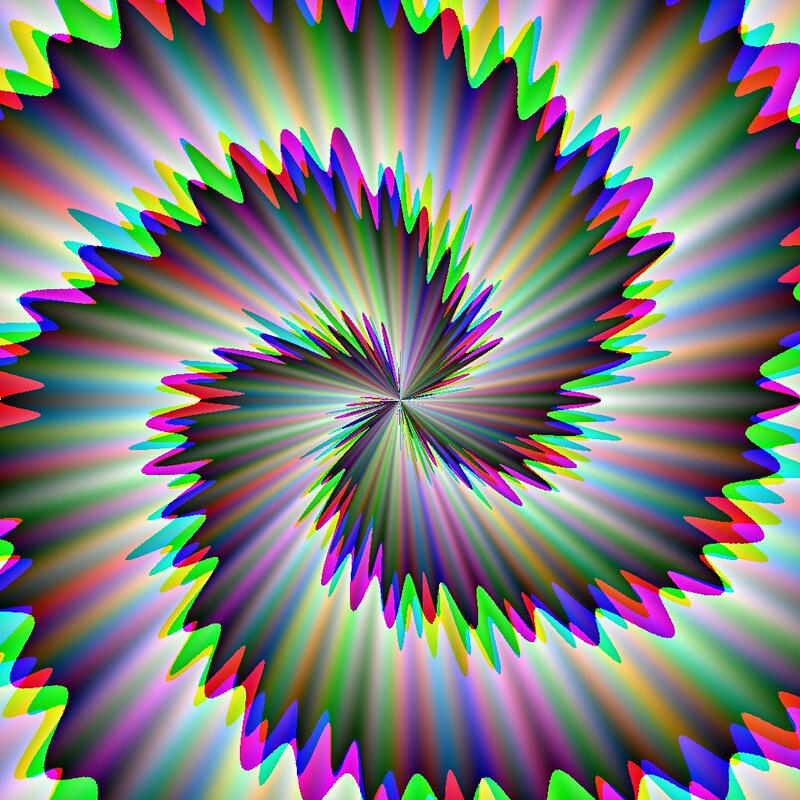 I'd love to see if anyone can find other cool spiral patterns. Also, I must say, this is by far one of the coolest challenges on here I have ever seen. Enjoy! 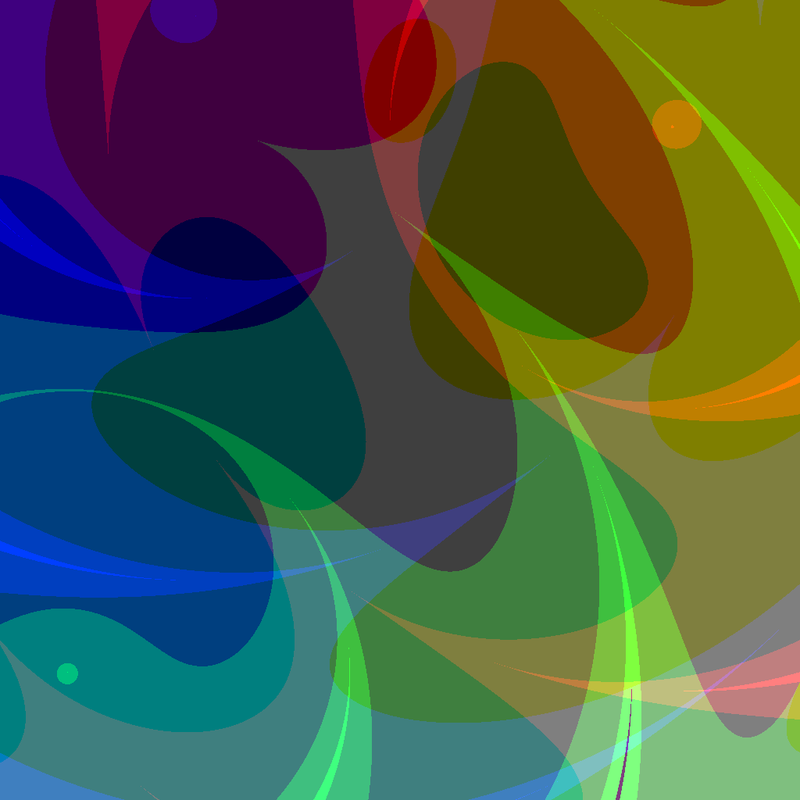 EDIT: Here are some backgrounds made from these spirals with altered parameters. 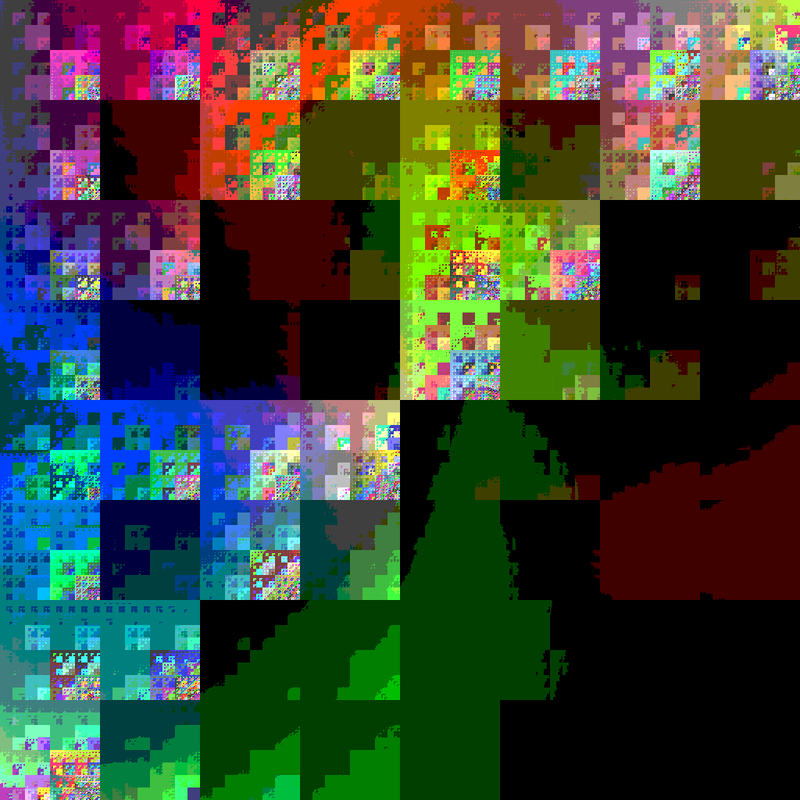 V1: Inspired by DreamWarrior's "Be happy", this straightforward submission embeds a small pixel-art image in each colour channel. I didn't even have to golf the code! V2: now with considerably shorter code & a thick black border isolating only the "game screen". V3: spaceship, bullet, damaged aliens and blue border, oh my! Trying to aim for this, roughly. I happened to stumble upon an edit by Umber Ferrule whose avatar inspired me to add another pixel-art-based entry. 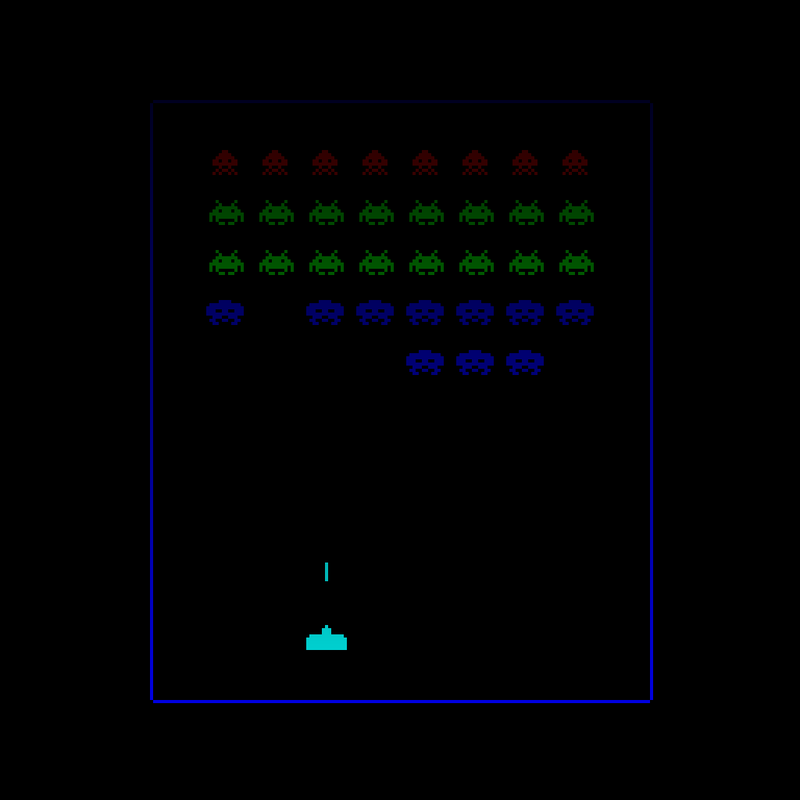 Since the core idea of the code is largely similar to the Space Invaders one, I'm appending it to this entry, though the two definitely had different challenging points. For this one, getting pink right (at the expense of white) and the fact that it's a rather big sprite proved nice challenges. The hexadecimal escapes (\xFF etc) in the red channel represent their corresponding characters in the source file (that is, the red channel in the source file contains binary data), whereas the octal escapes are literal (i.e. present in the source file). for a relentless group golfing session. 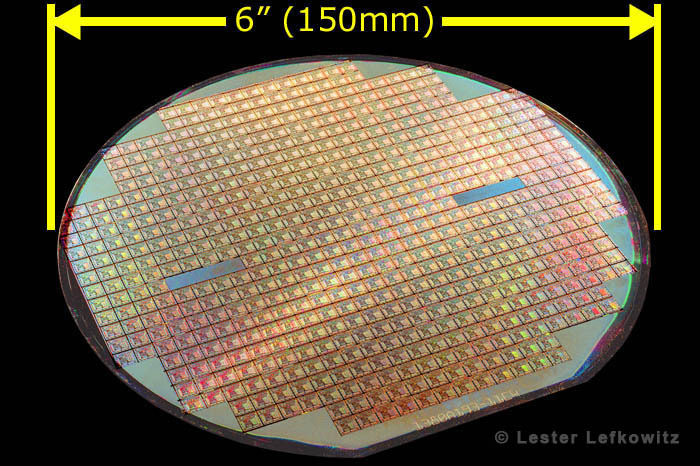 The E(q) macro is used in the RD and GR functions. 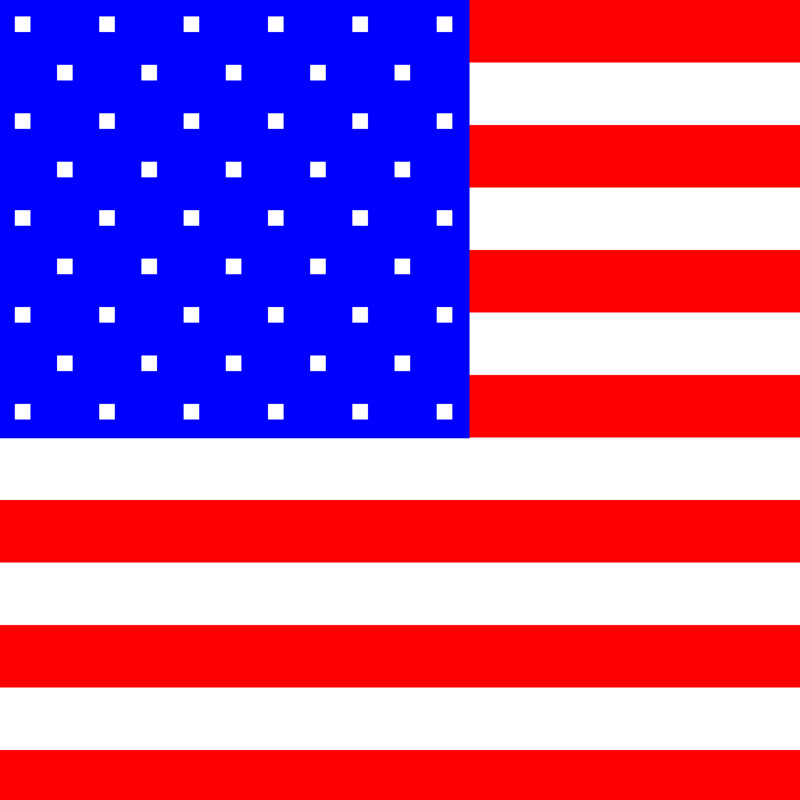 Changing the value of the argument changes the way the red and green components of the colours change. 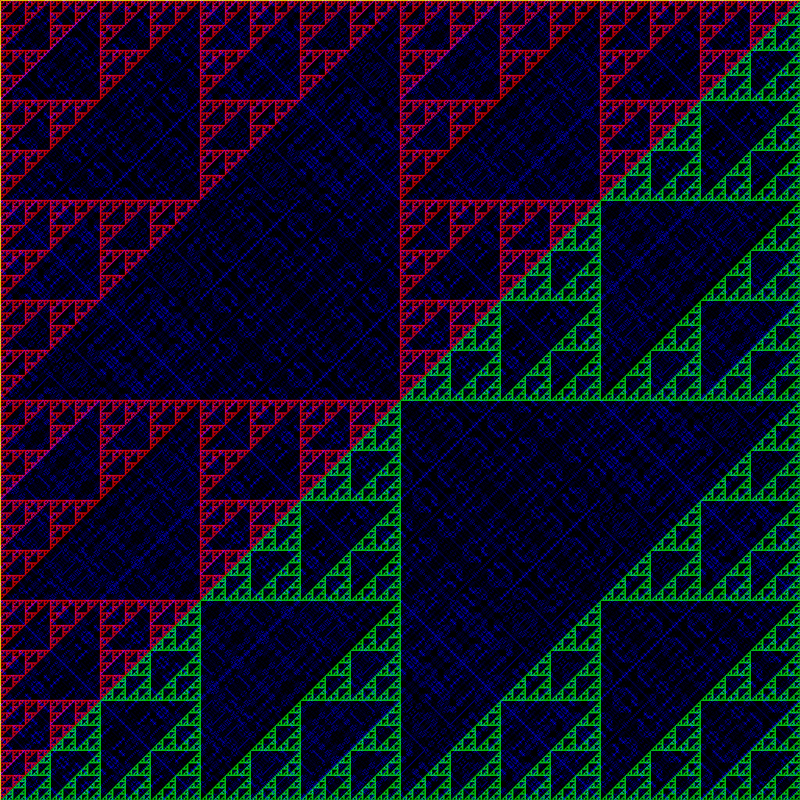 The J macro ends with a number which is used to determine how much the blue component changes, which in turn affects the red and green components because they are calculated from it. I've include some images with the red and green arguments of E varied to show the variety of colour combinations possible. 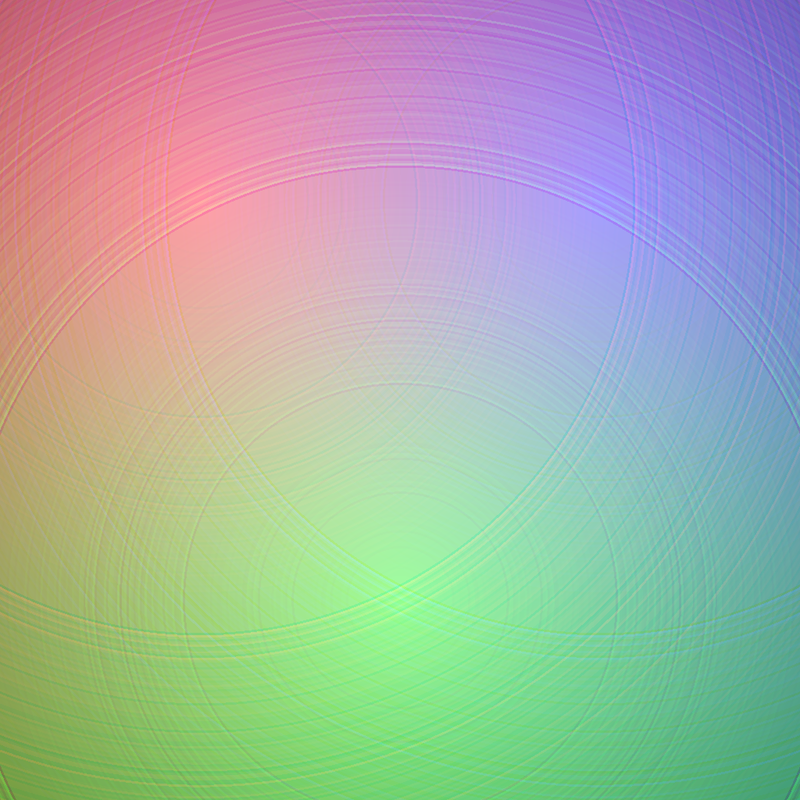 Hover over the images for the red and green values if you want to run these yourself. All of these images can be viewed at full size if you download them. The file size is small as the flat colour suits the PNG compression algorithm, so no lossy compression was required in order to upload to the site. If you'd like to see images from various stages in the golfing process as we tried out different things, you can look in the action painting chat. 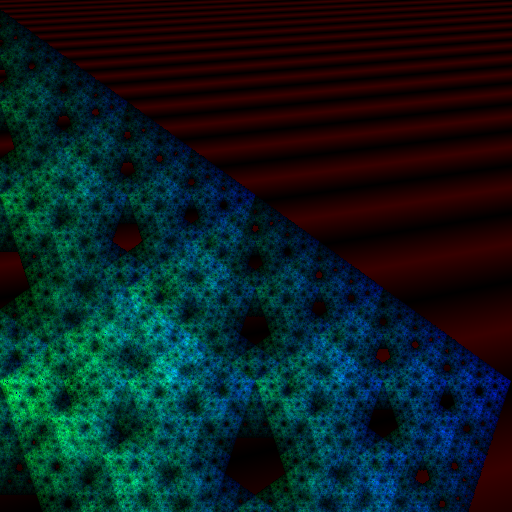 Figured I'd play with this code's parameters... All credit goes to @Manuel Kasten. These are just so cool that I couldn't resist posting. Edit: This is now a valid answer, thanks to the forward declarations of GR and BL. 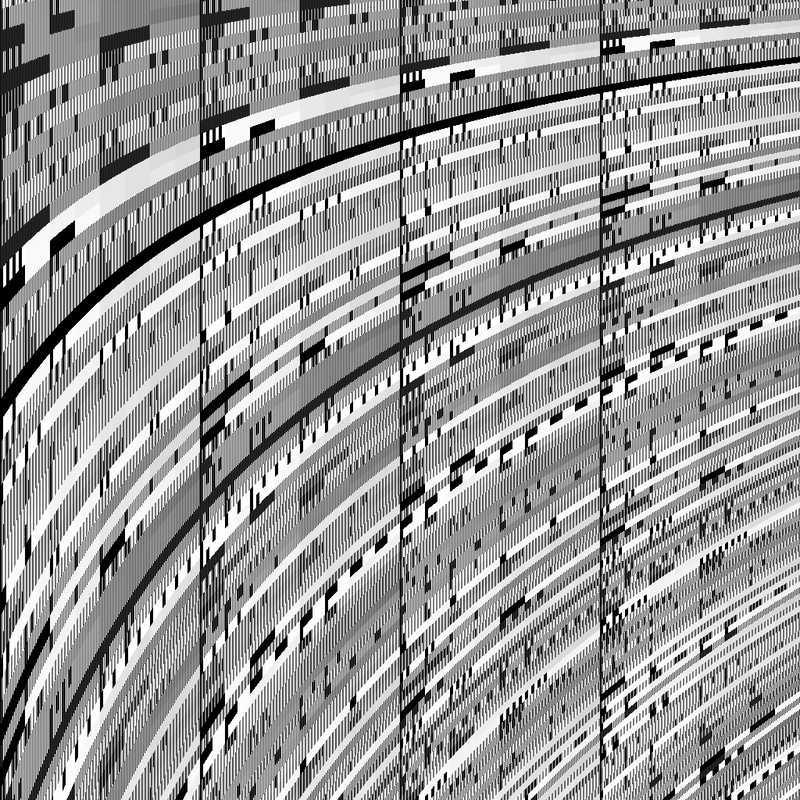 Having fun with Hofstadter's Q-sequence! 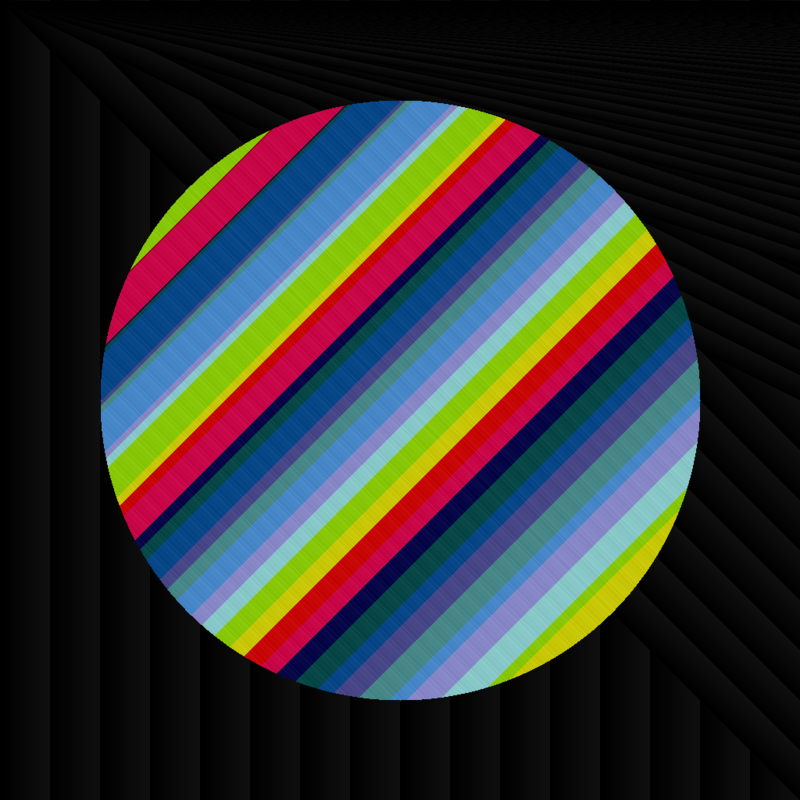 If we're using the radial distance from some point as the input and the output as the inverse colour, we get something which looks like coloured vinyl. 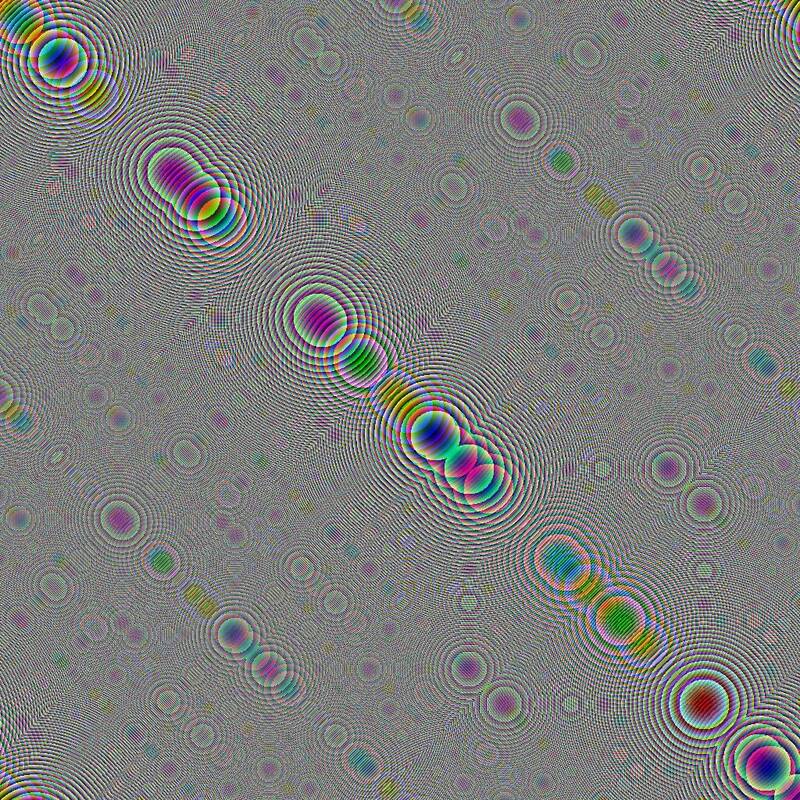 You can see these ripples in the image after regions which look very "flat" in colour. 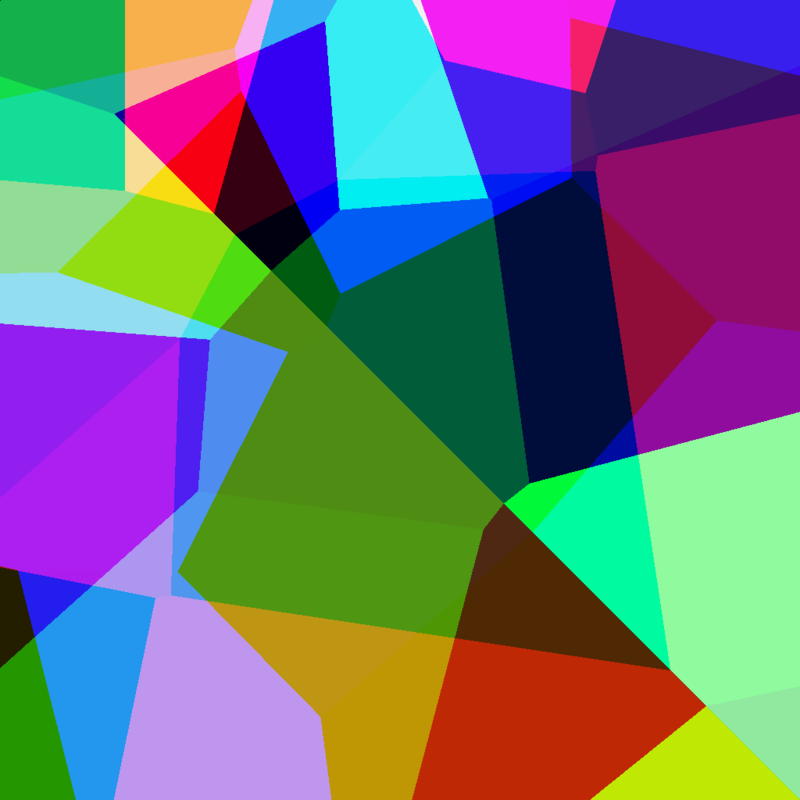 Of course, using only one colour is boring. Now for the code. I need the recursive function to compute the sequence. To do that I use RD whenever j is negative. Unfortunately, that does not leave enough characters to compute the red channel value itself, so RD in turn calls GR with an offset to produce the red channel. Of course, this is pretty much the simplest possible usage of the sequence, and there are loads of characters left. Feel free to borrow it and do other crazy things with it! 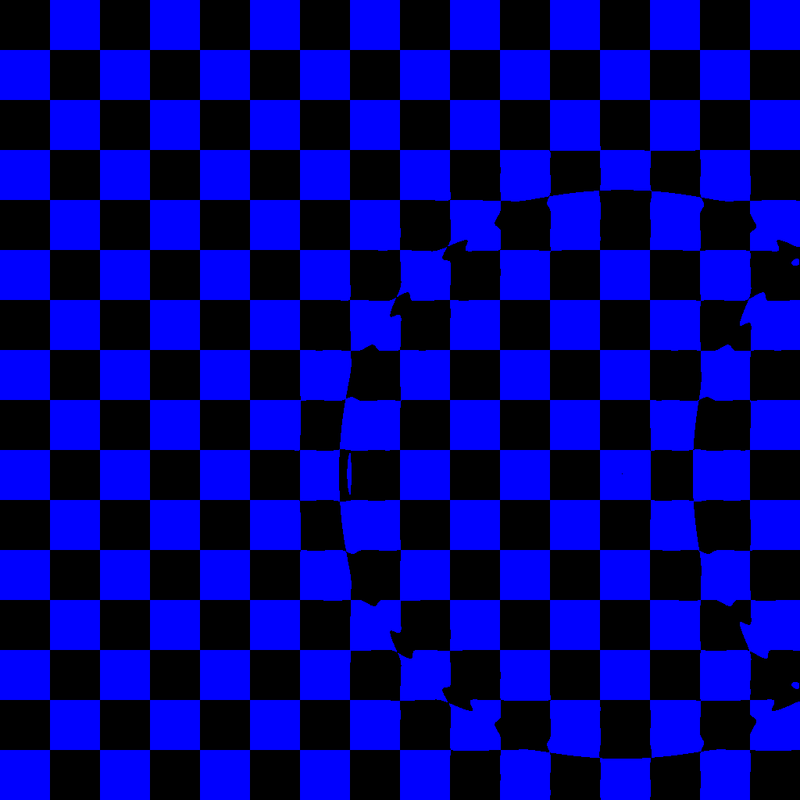 This calculates the Joukowsky transform of a set of concentric circles centred on a point slightly offset from the origin. 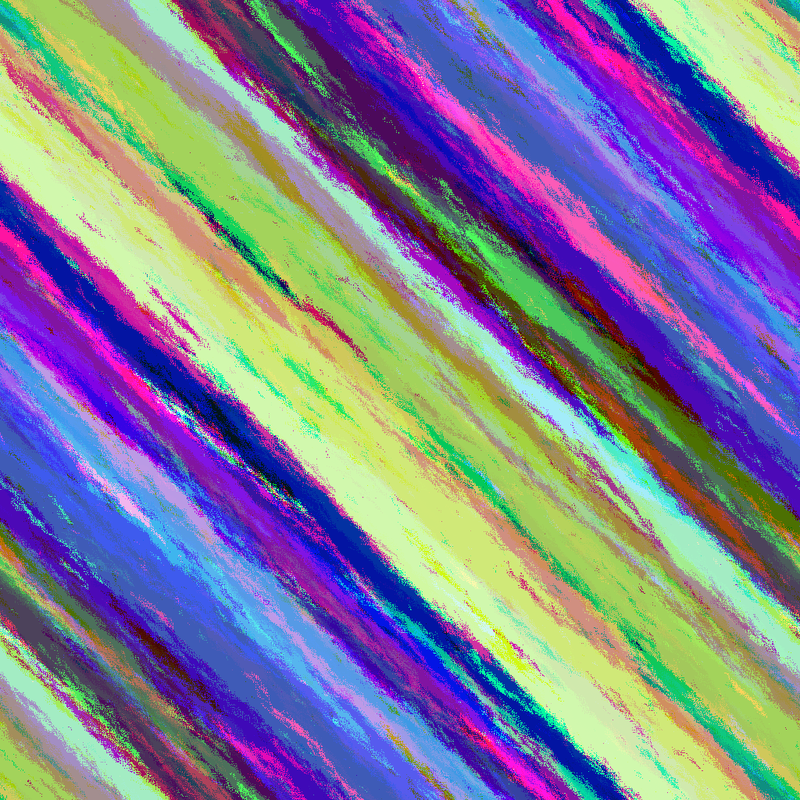 I slightly modified the intensities in the blue channel to give a bit of colour variation. Rewrote the C++ code in Objective-C cos I couldn't get it to compile... It gave the same results as other answer when running on my iPad, so that's all good. 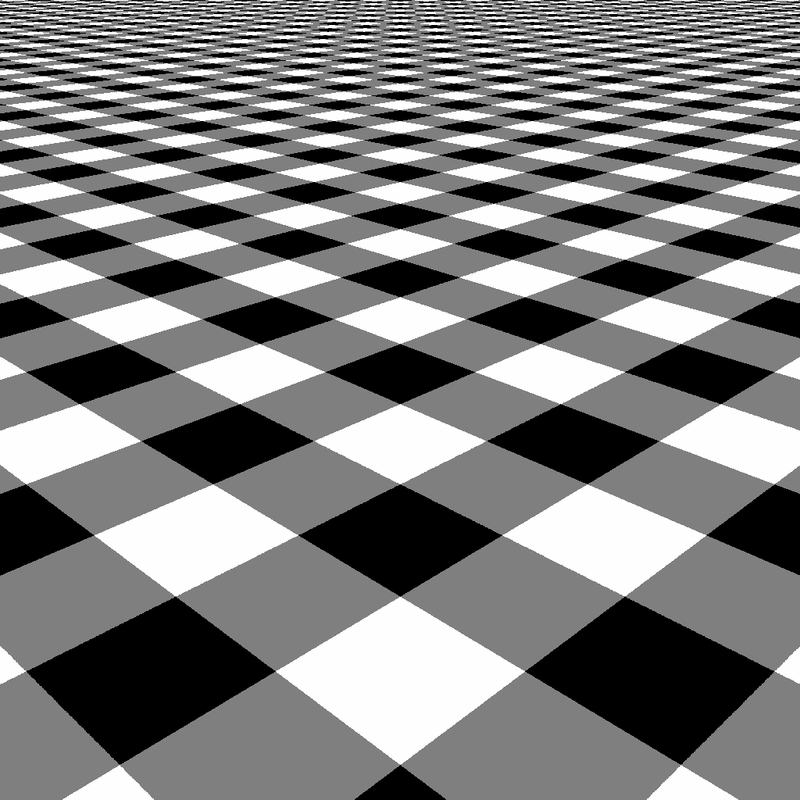 You can zoom in on squares by multiplying i and j by 0.5, 0.25 etc. before they are processed. 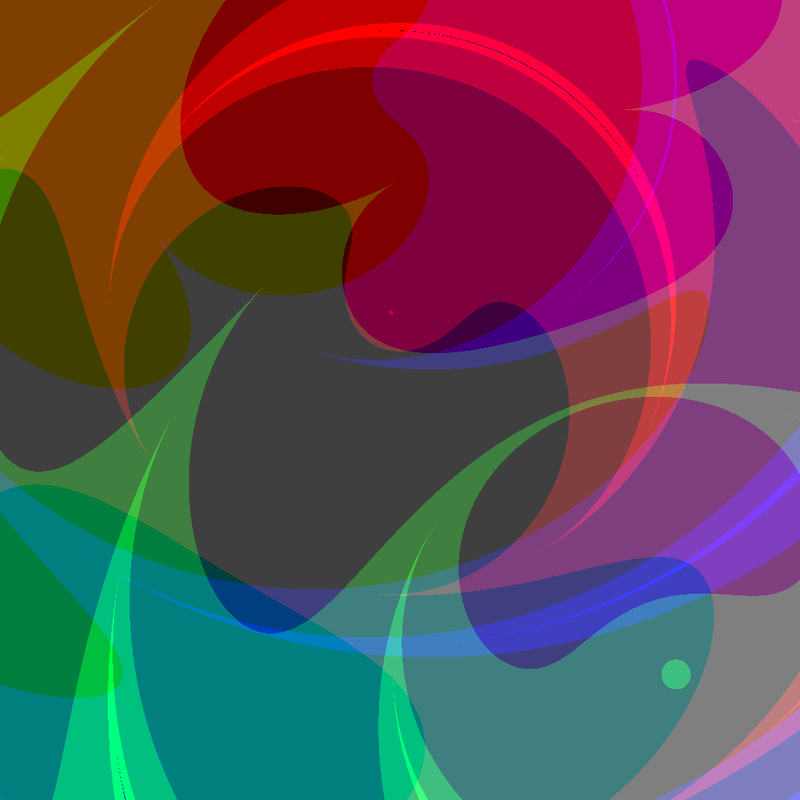 I wanted to play more with colors so I kept changing my other answer (the swirly one) and eventually ended up with this. And, of course, a host of other possible results depending on your compiler, computer, memory manager, etc. Just some trigonometry and weird macro tricks. EDIT: if M_PI isn't allowed due to only being present on POSIX-compatible systems, it can be replaced with the literal 3.14. I'm not good at math. I was always poor student at math class. So I made simple one. It's very short so all three functions fits in one tweet. Another version. function bodies are tweetable. Inspired by Martin's obviously awesome entry, this is a different take on it. 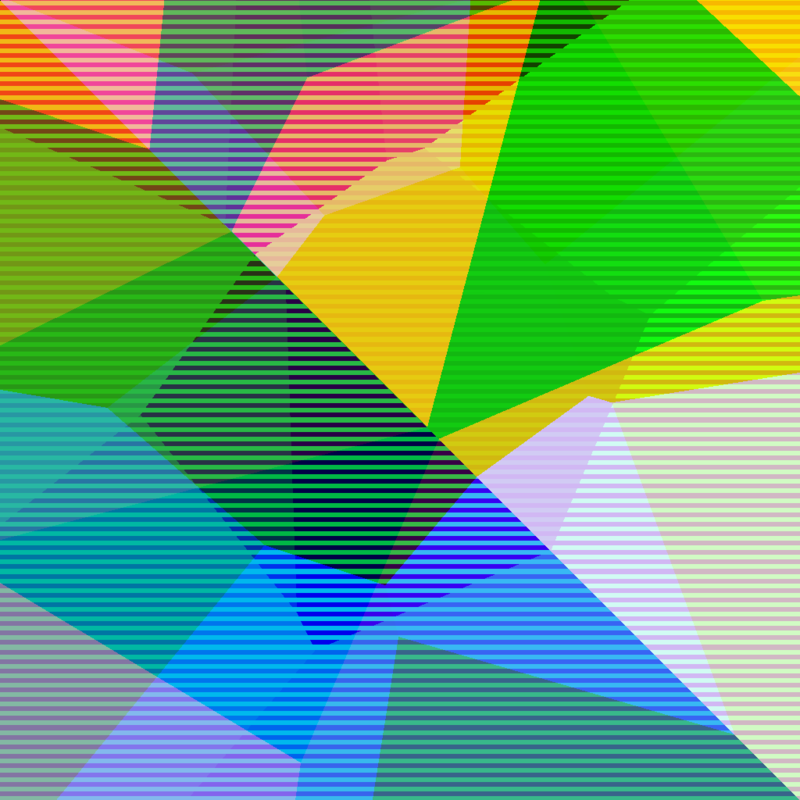 Instead of randomly seeding a portion of the pixels, I start with the top left corner as RGB(512,512,512), and take random walks on each color from there. 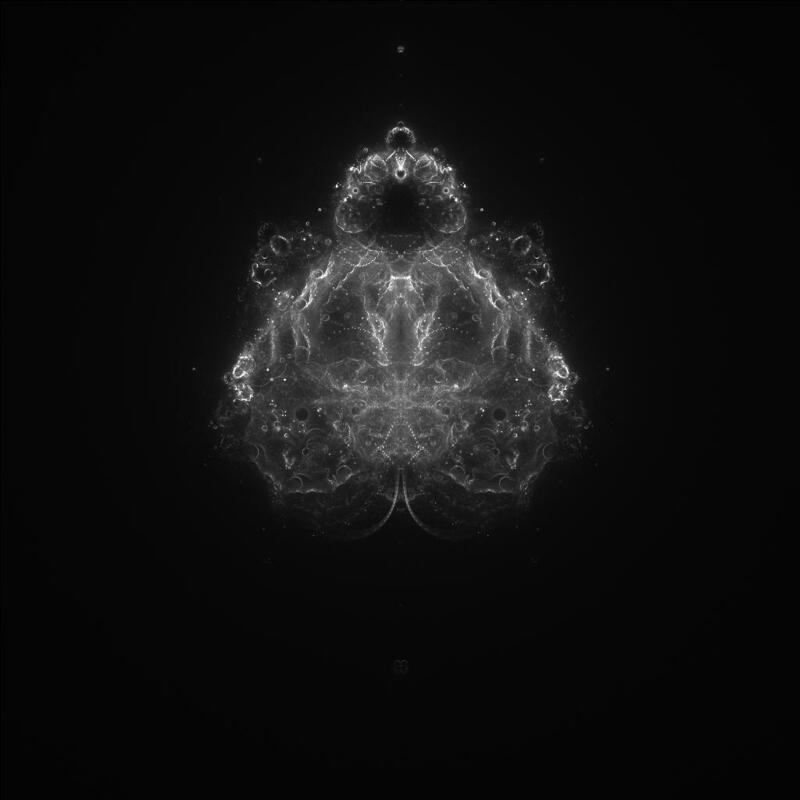 The result looks like something from a telescope (imo). 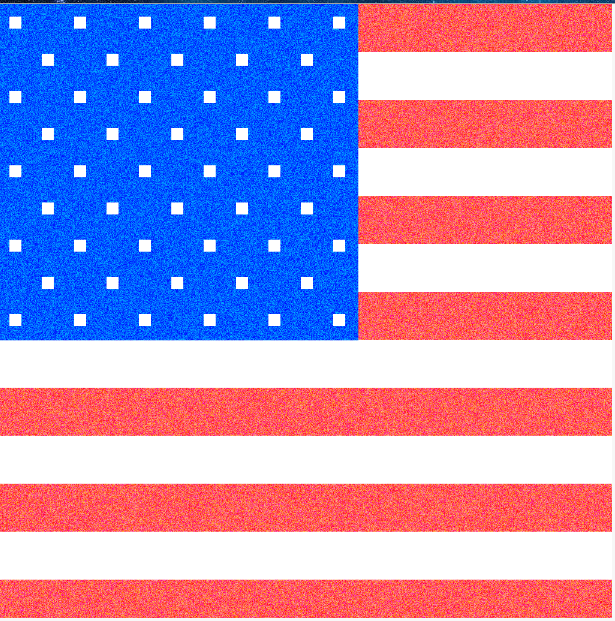 Each pixel takes the average of the pixels above/left of it and adds a bit o' random. 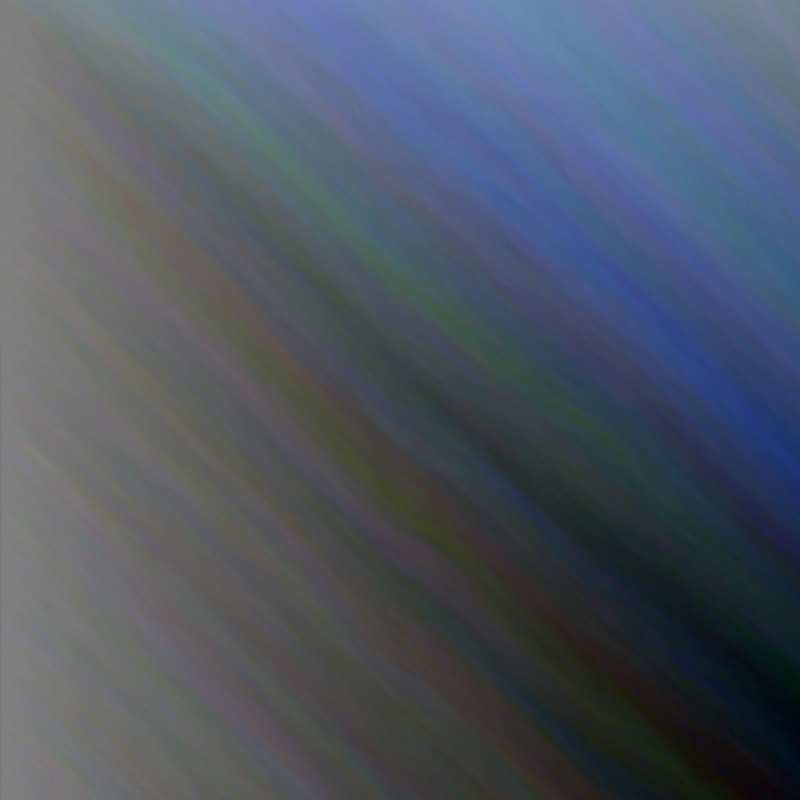 You can play with the variability by changing the p variable, but I think what I'm using is a good balance (mainly because I like blue, so more blur volatility gives good results). 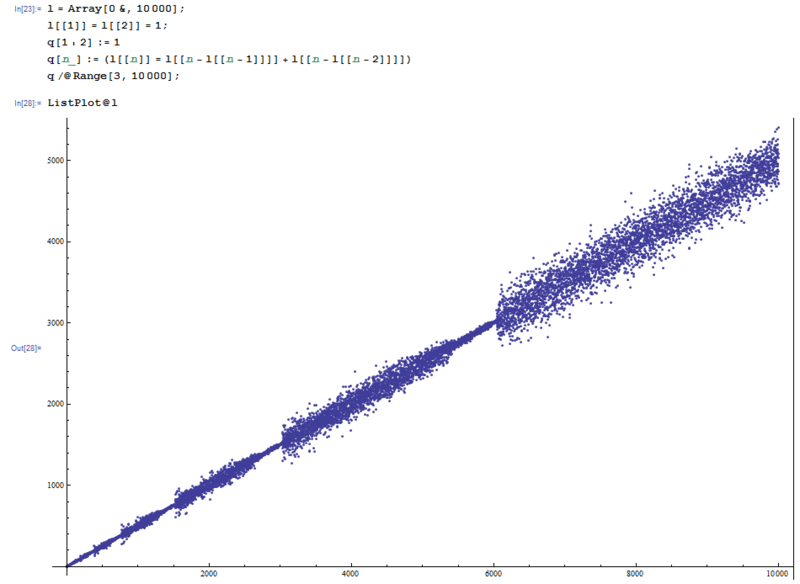 There's a slight negative bias from integer division when averaging. I think it works out, though, and give a nice darkening effect to the bottom corner. Of course, to get more than just a single result, you'll need to add an srand() line to your main function. 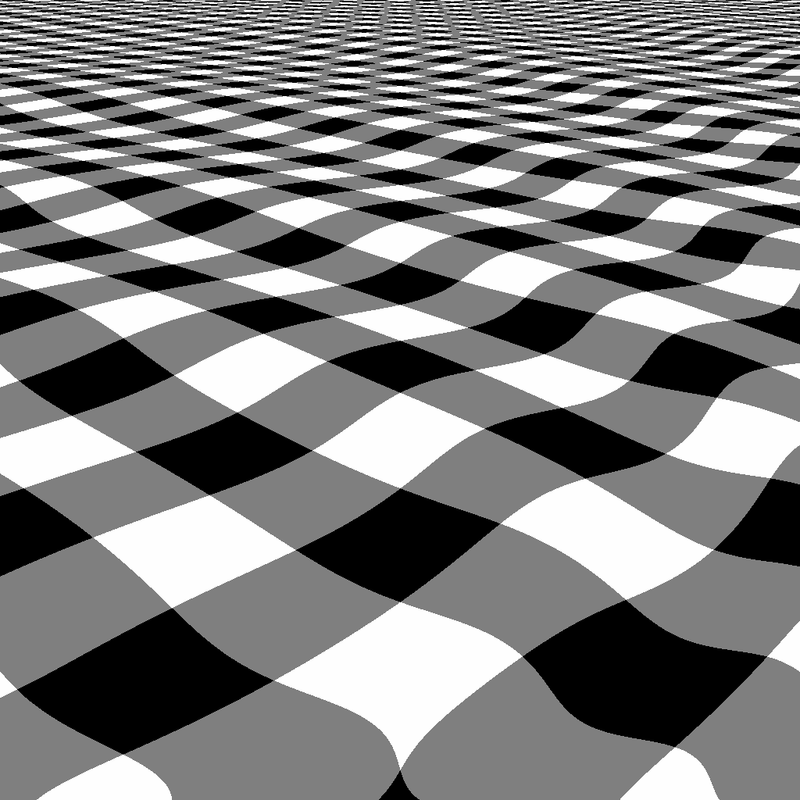 A basic chess board pattern distorted according to the position of a wave expanding from a point like a stone dropped in a pond (very far from physically accurate!). 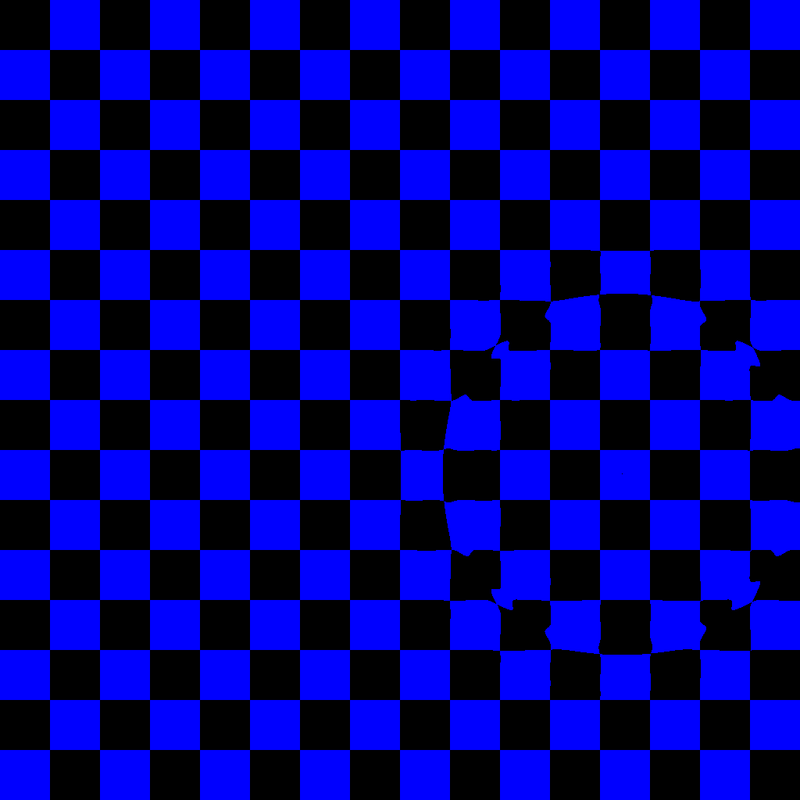 The variable w is the number of pixels from that point that the wave has moved. 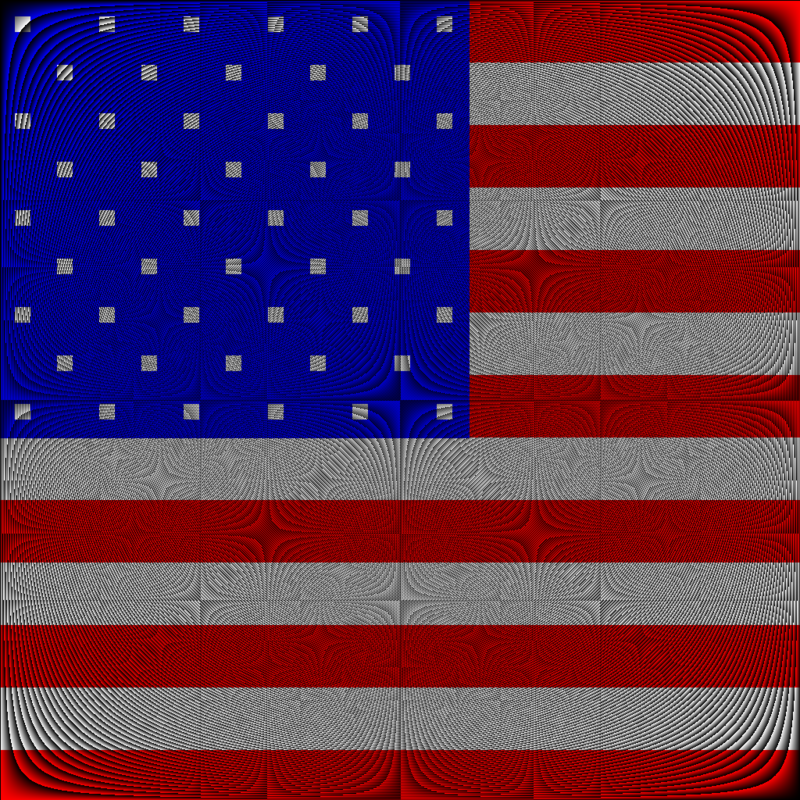 If w is large enough, the wave reflects from the sides of the image. 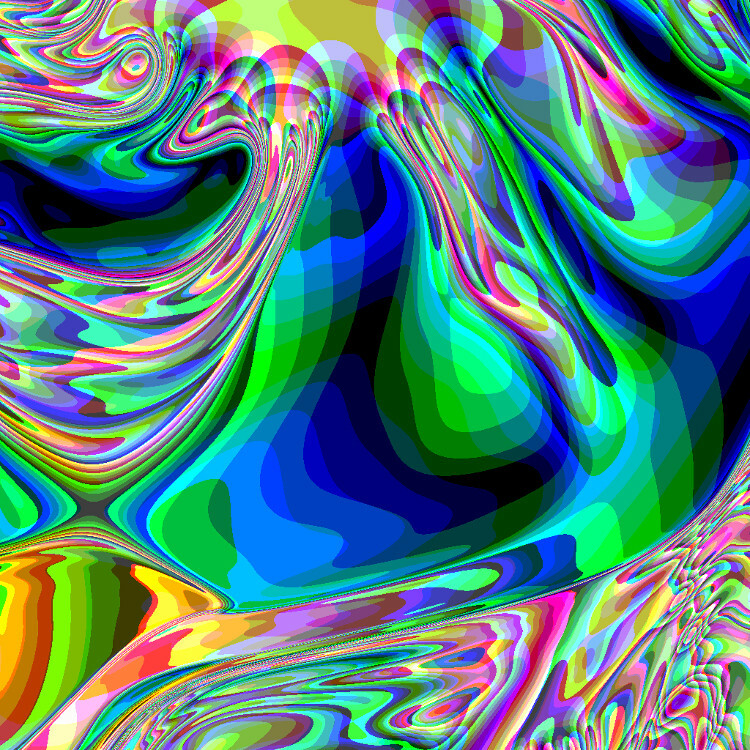 Here is a GIF showing a succession of images as the wave expands. I've provided a number of different sizes, each showing as many frames as the 500KB file size limit will allow. 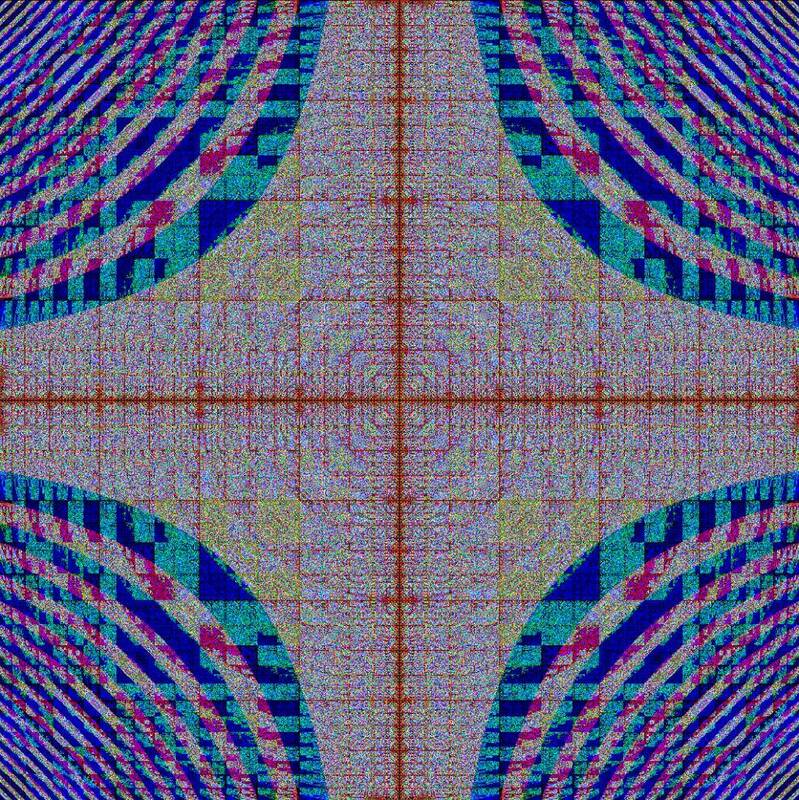 If I can find a way to fit it in, I'd ideally like to have wave interference modelled so that the waves look more realistic when they cross. I'm pleased with the reflection though. Not the answer you're looking for? Browse other questions tagged math popularity-contest graphical-output or ask your own question.